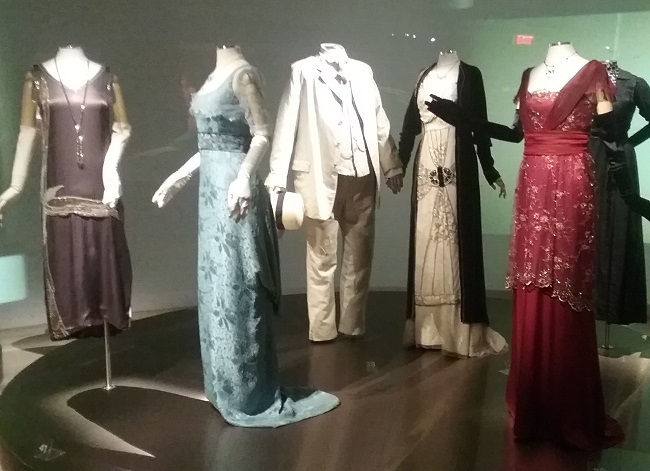 I bet you could have guessed that this set of costumes is from Downton Abbey. 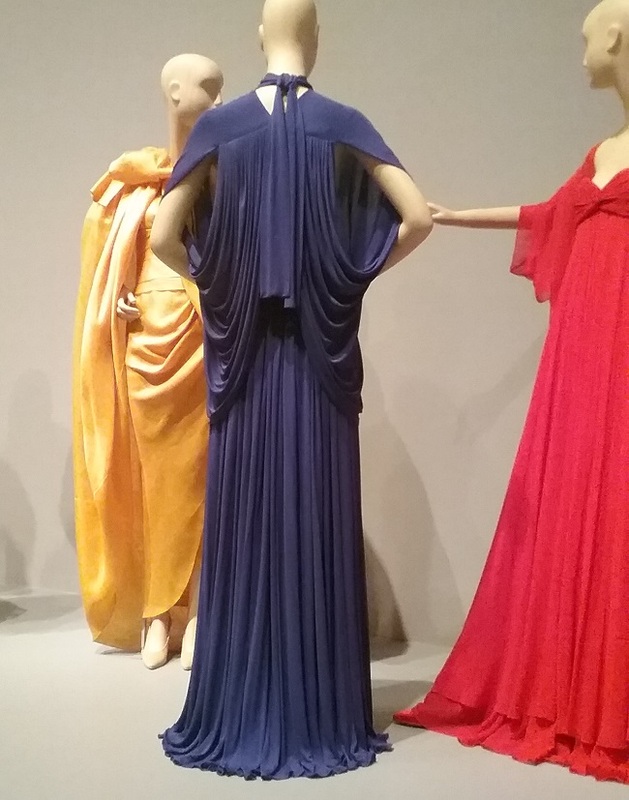 Though spread over several years, the three dresses in front represent the Crowley sisters, Edith, Sybil, and Mary. 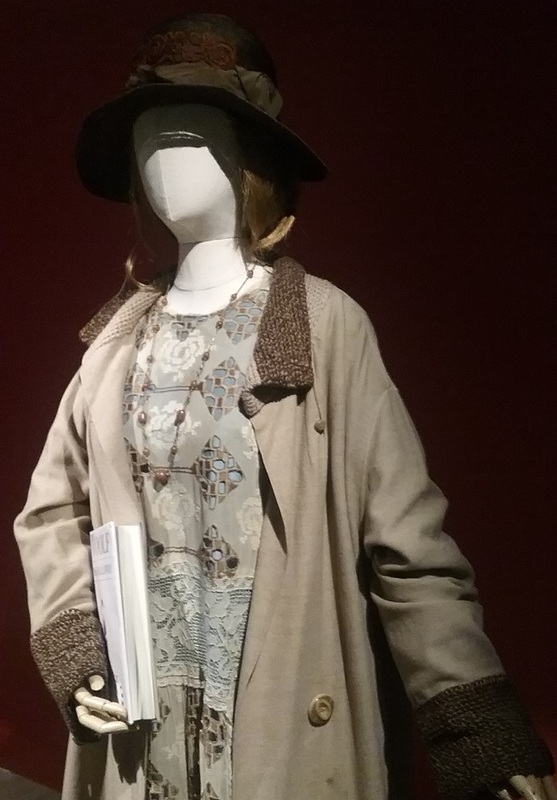 Edith’s dress is from the fifth season, and so is from the mid 1920s. 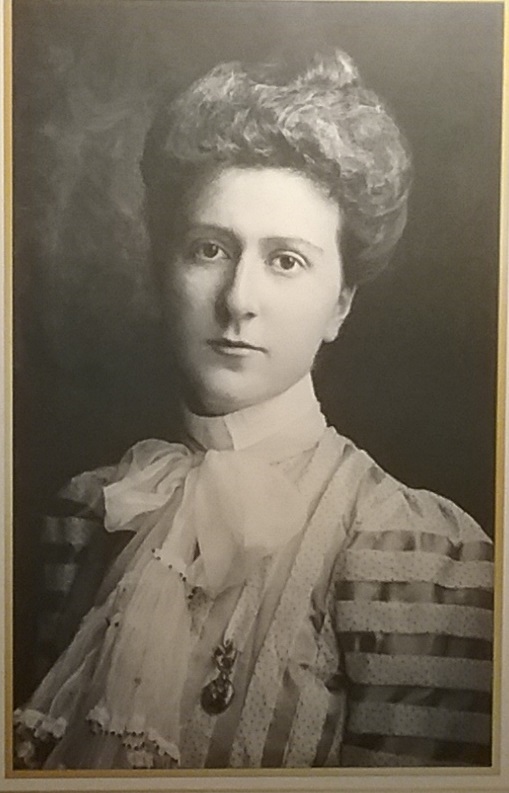 If you can remember, Edith was the “plain” sister. 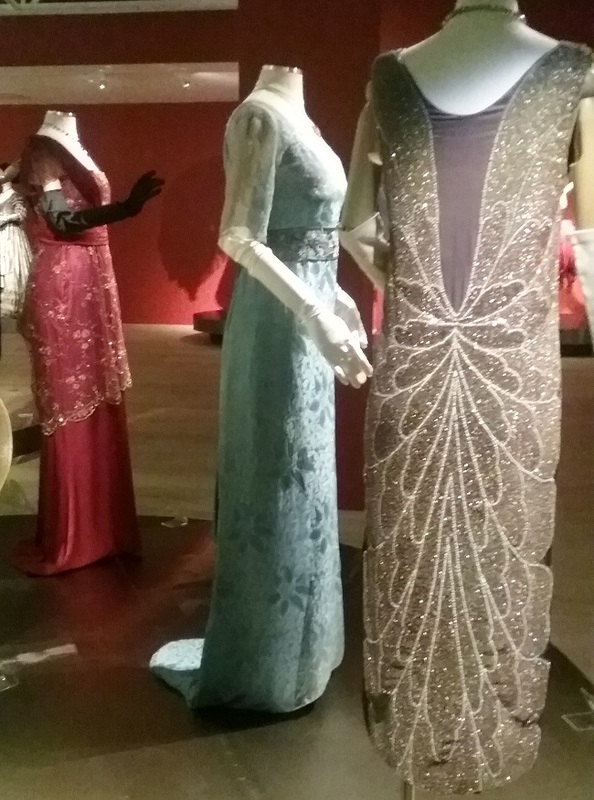 In the middle is a Sybil dress, circa 1912, as is Mary’s red dress on the right. 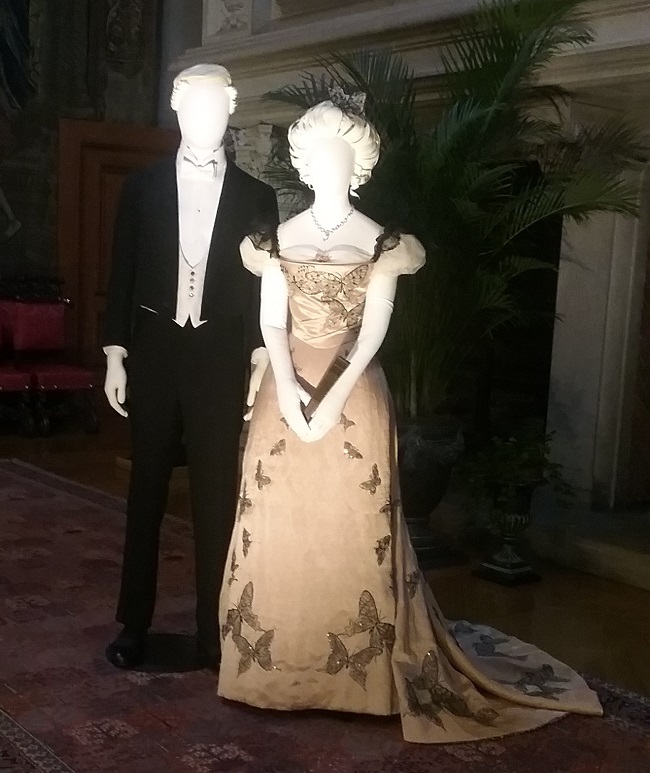 In the background are Earl and Countess Grantham, the girls’ long-suffering parents. 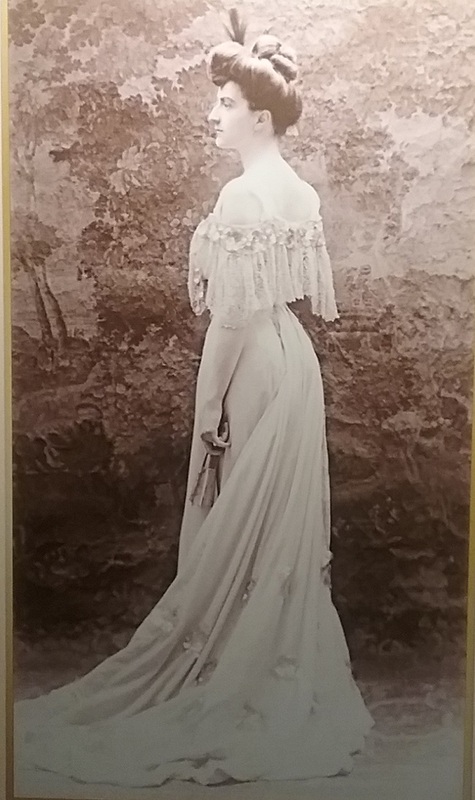 From the back we can see there is more to Edith than meets the eye. 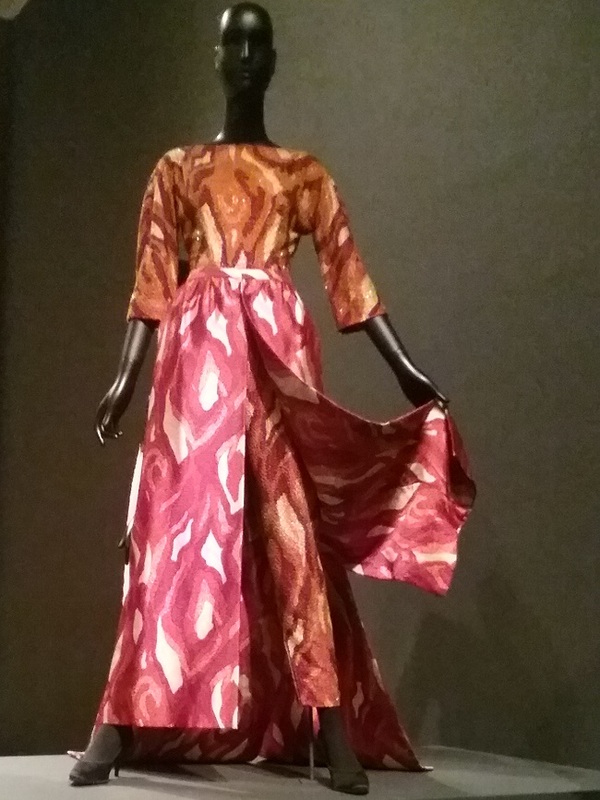 One thing I love about SCADFASH is that the place fosters conversation between visitors and docents. 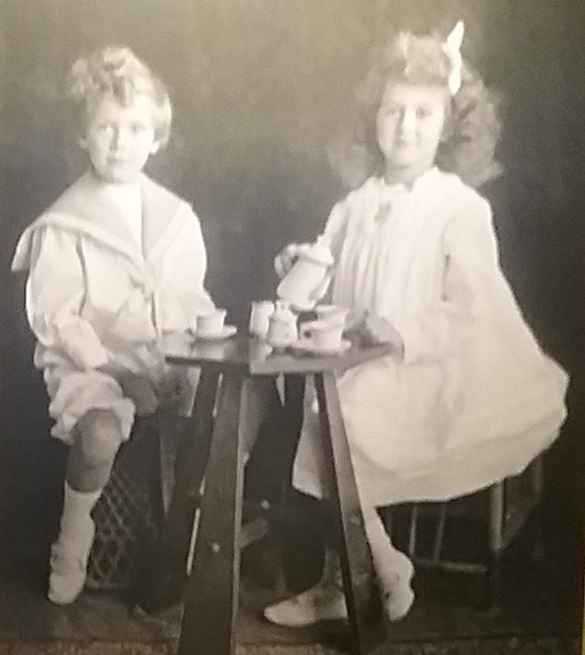 There was a pair of young women who were touring the exhibition at the same time a us, and it surprised me that neither of them had seen Downton Abbey. 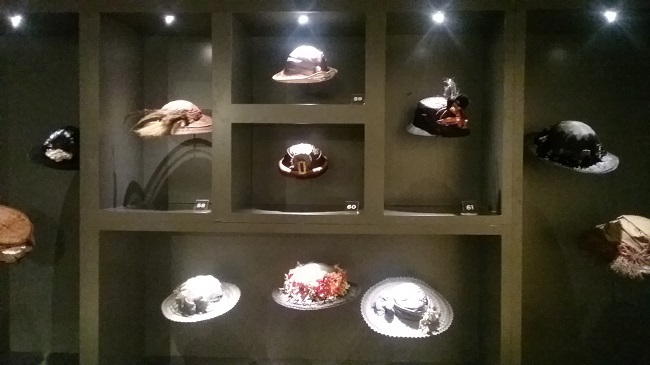 If ever a movie in recent memory was known for the hats, it was Titanic. Because of the lighting I was not able to be a really good shot of all of them. And I really could not get one that shows just how massive some of these were. 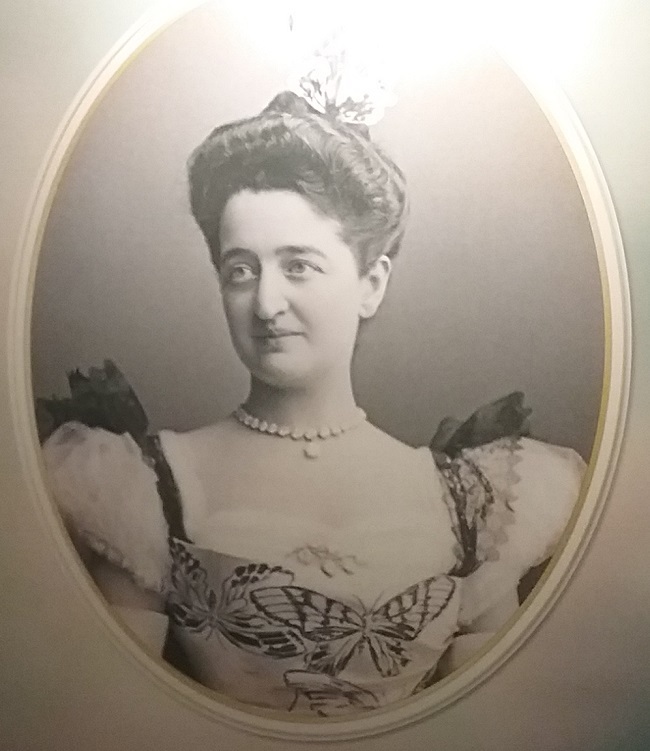 I wonder if women during this period had neck problems from trying to balance those things on their heads? 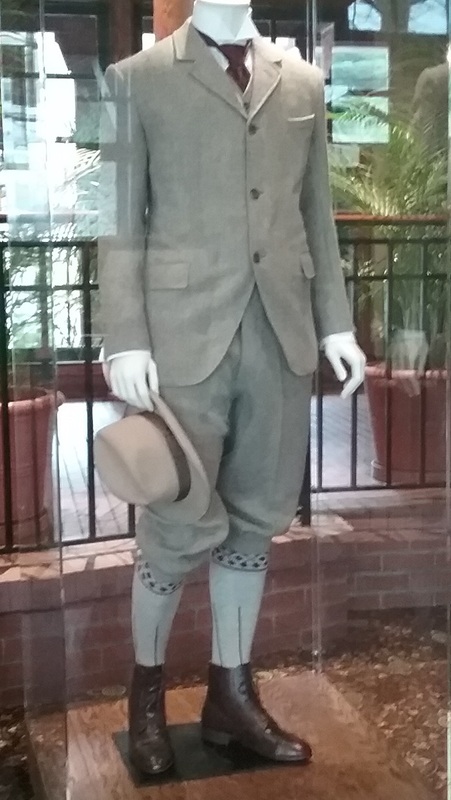 When looking at costumes, I find that I get more from seeing the ones from the movies and programs I have actually seen. 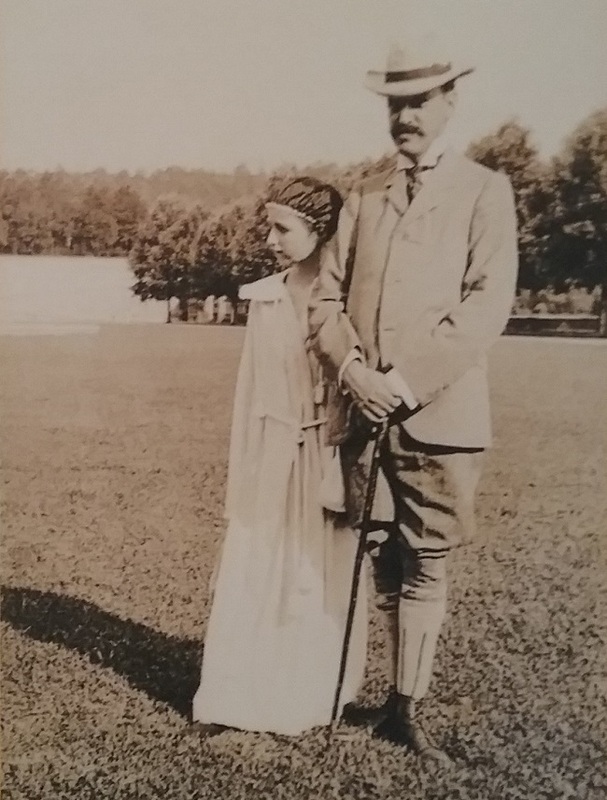 Take this one, for example, and imagine Meryl Streep as Karen Blixen in Out of Africa, as she prepares to make the mistake of a lifetime by marrying the wrong man. It does look better from this angle. 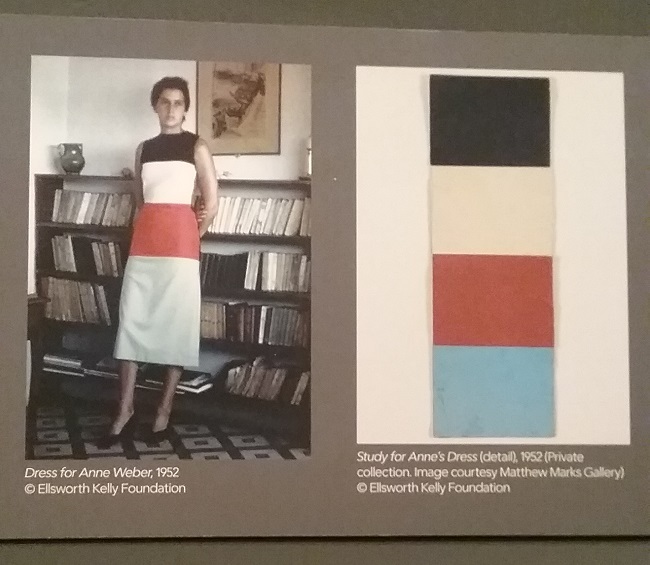 You can at least see the pretty work on the dress. 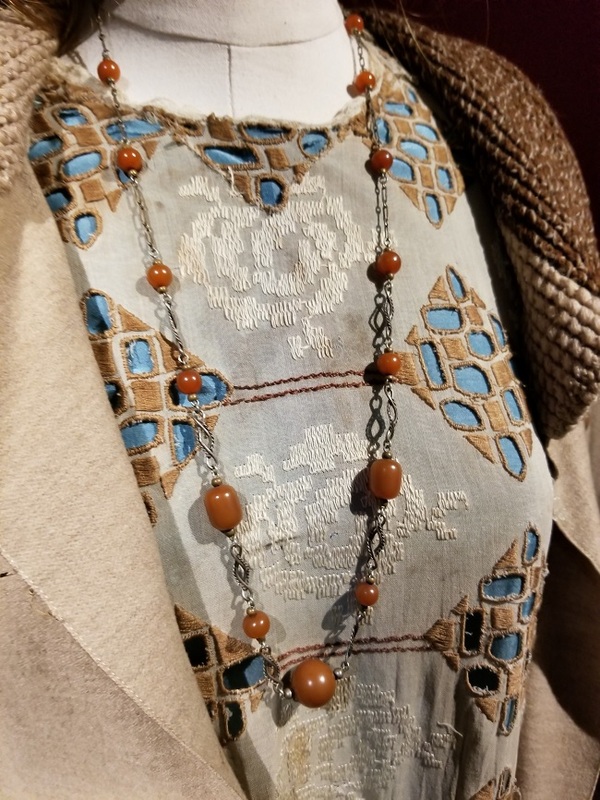 It has a light blue lining with a cut-work cotton dress. 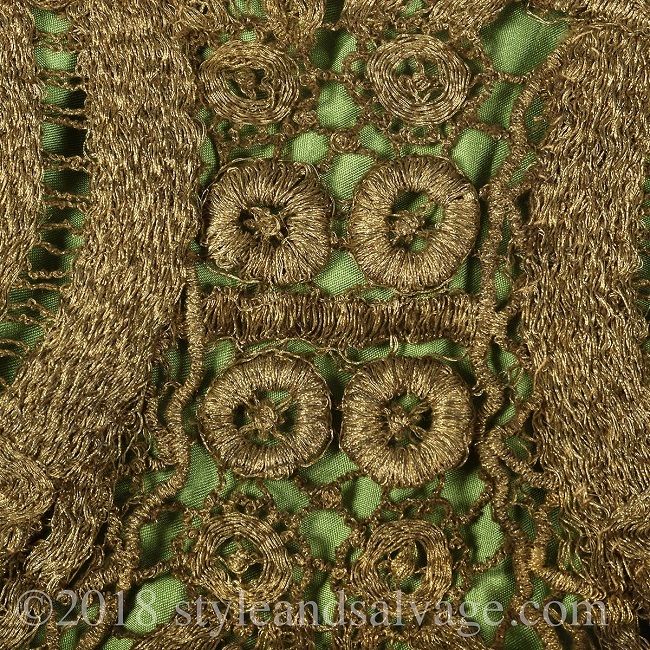 The brown embroidery on the cut-work really does enhance the brown of the coat. Thanks to Liza for this photo. 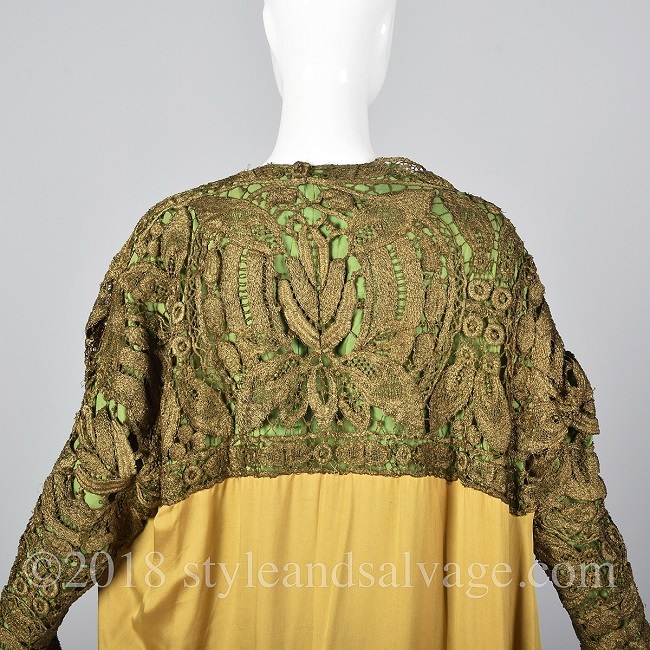 Cosprop is owned by John Bright, who is also a collector of historical dress. 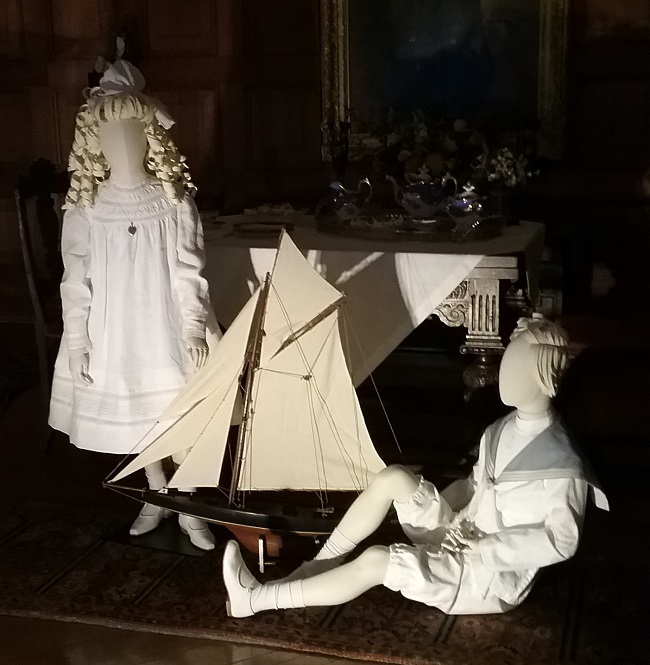 Much of his collection can be seen on his website, The John Bright Collection. 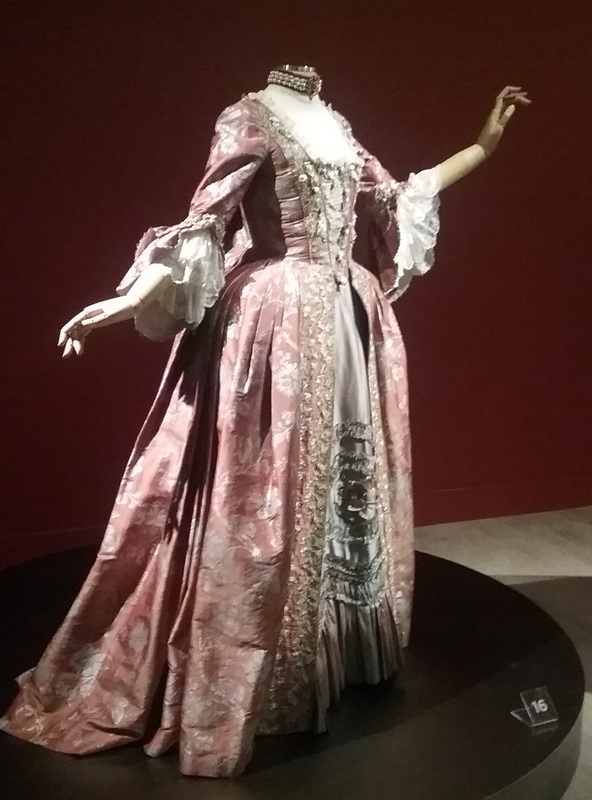 Let’s start Part II with this great costume from Elizabeth. 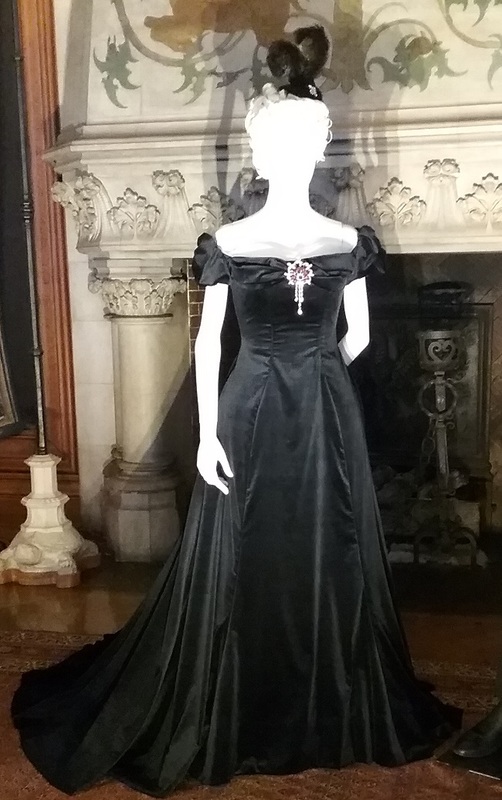 This silk velvet gown was worn by Cate Blanchett as Queen Elizabeth in this 1996 film. 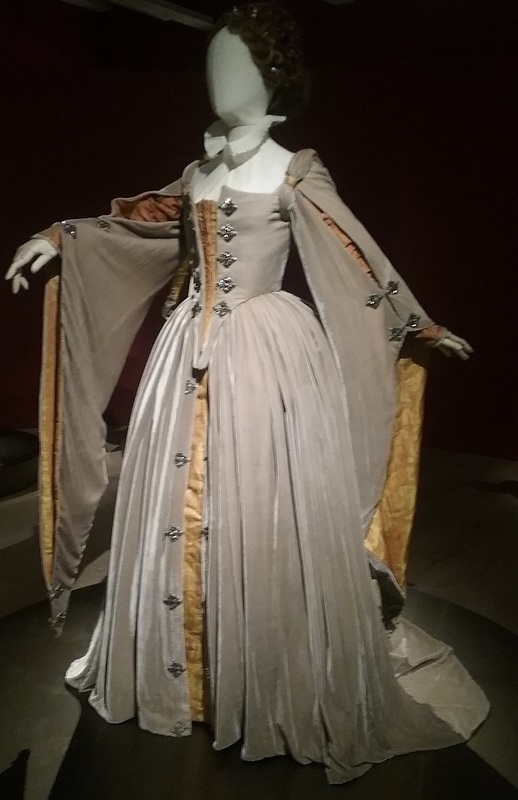 The designer was Alexandra Byrne, who co-incidentally designed the costumes for the currently showing Mary Queen of Scots. 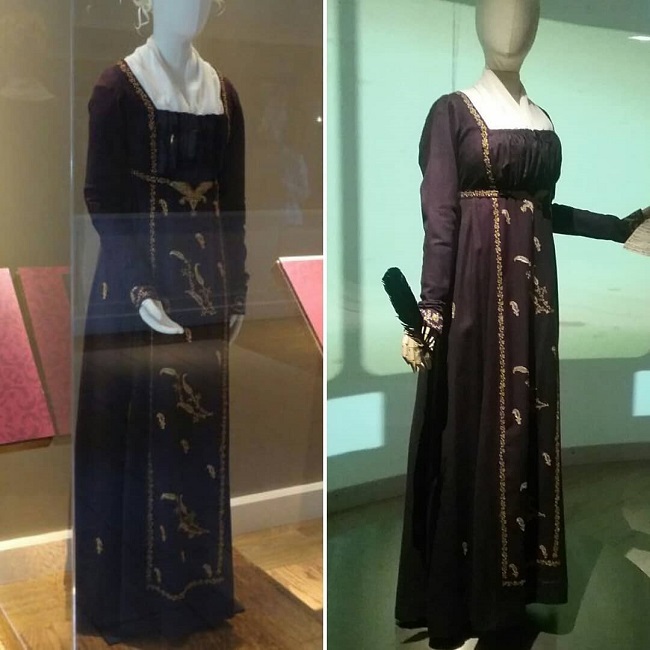 It would be interesting to compare the costumes for Mary and Elizabeth in both films. 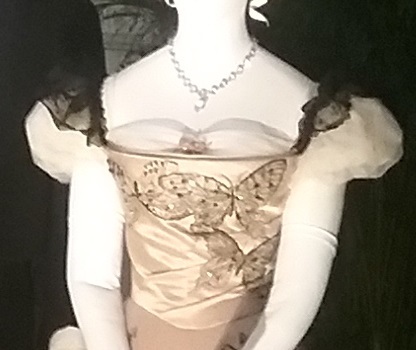 I loved the way this one was mounted with the mannequin’s arms spread wide to show some very spiffy sleeves. 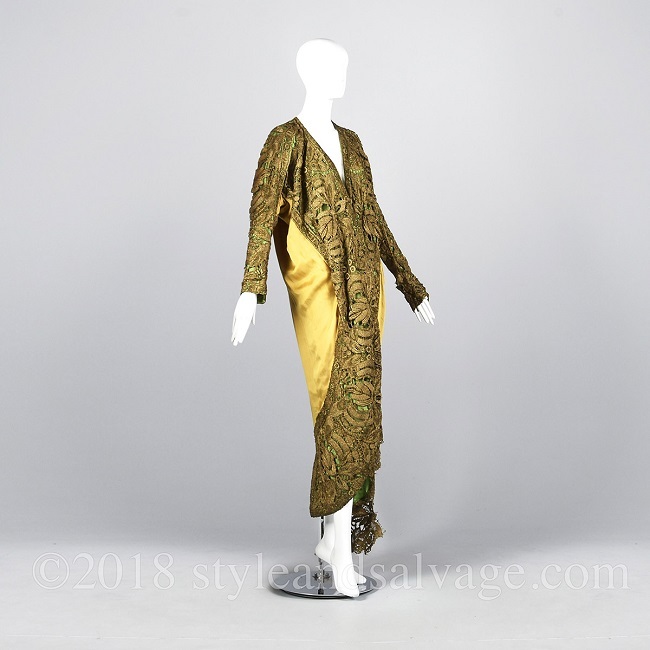 In 1989 designer James Acheson won the Oscar for best costume design for Dangerous Liaisons. 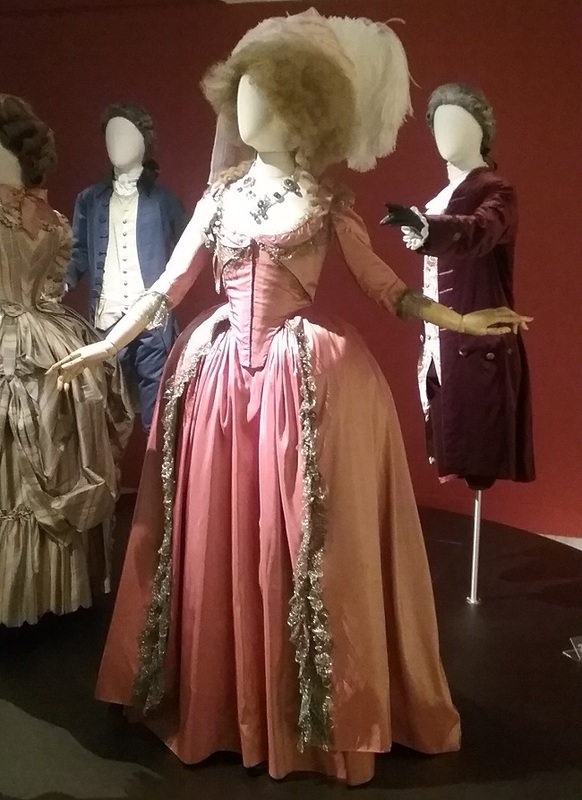 This exhibition had three dresses from the film, which was set in eighteenth century France. 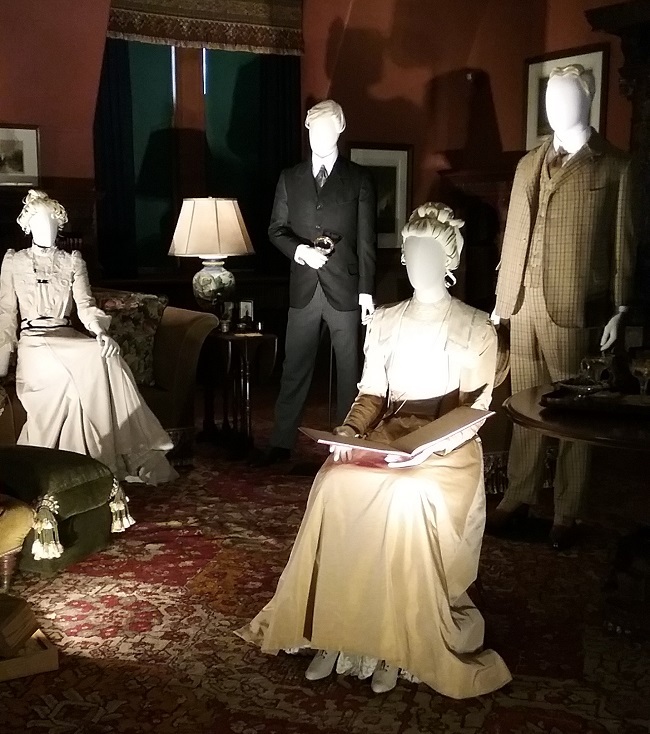 These costumes show just how much work goes into a costume drama of this magnitude. 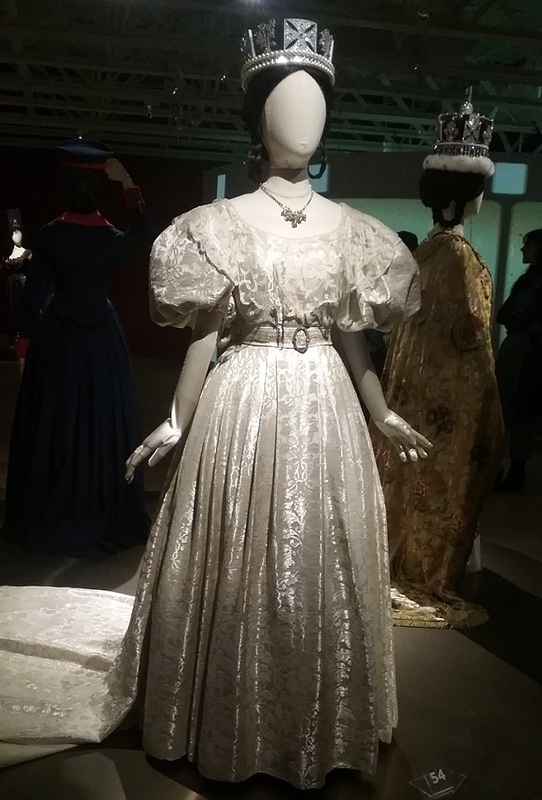 The dresses we saw were worn by two of the more minor characters (and older women to boot) but the detail and design might make one think these dresses were the true stars of the show. 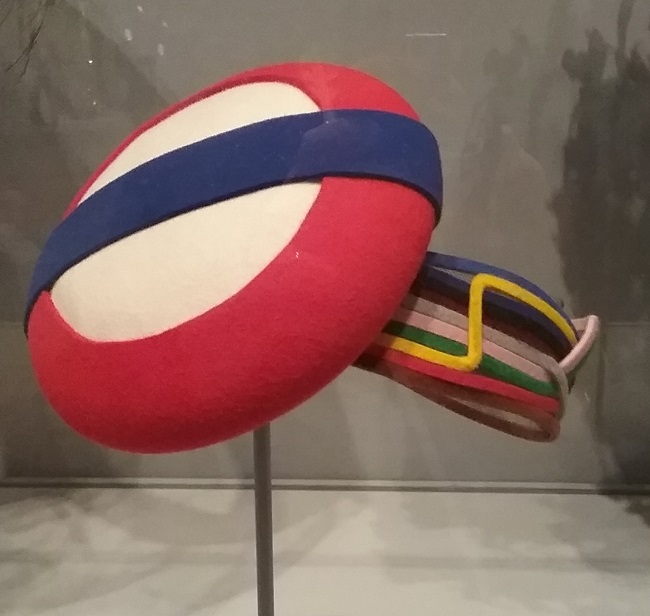 The back view shows the fashionable sack back. 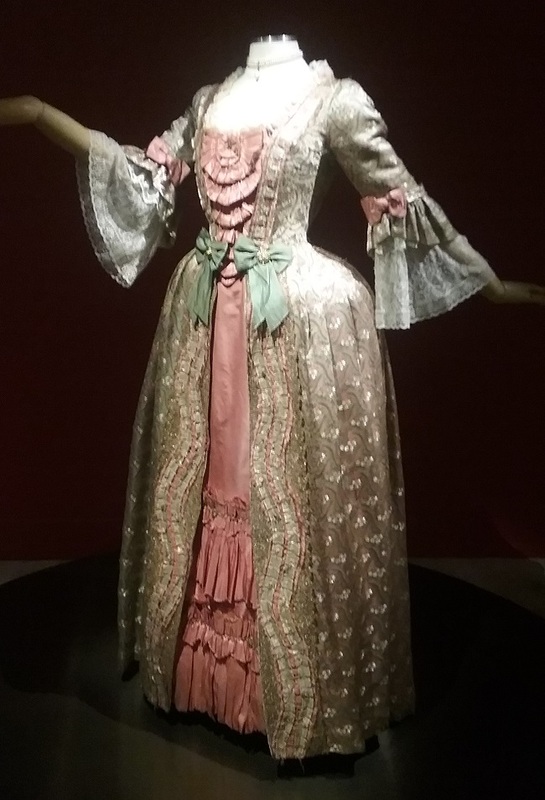 This dress was worn by actress Mildred Natwick as Madame de Rosemonde. It was her last film role. 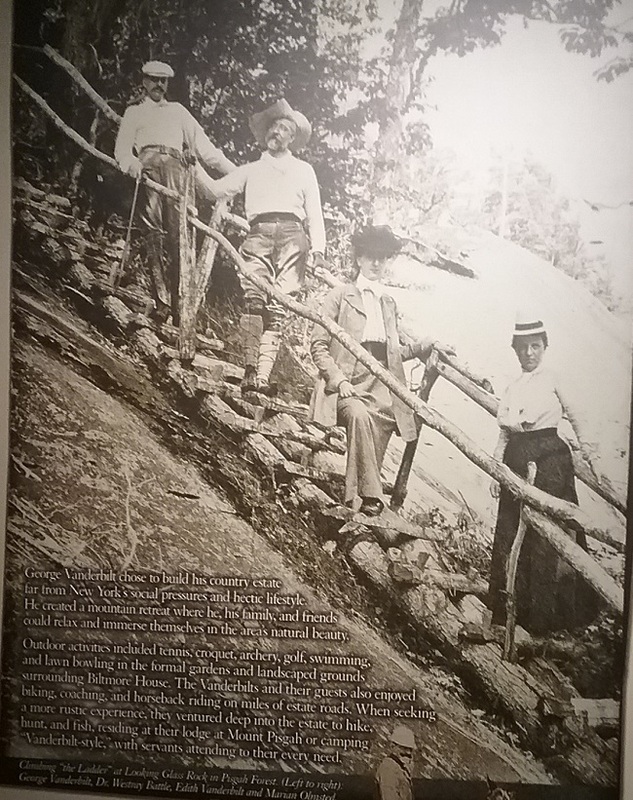 She was eighty-three years old at the time! 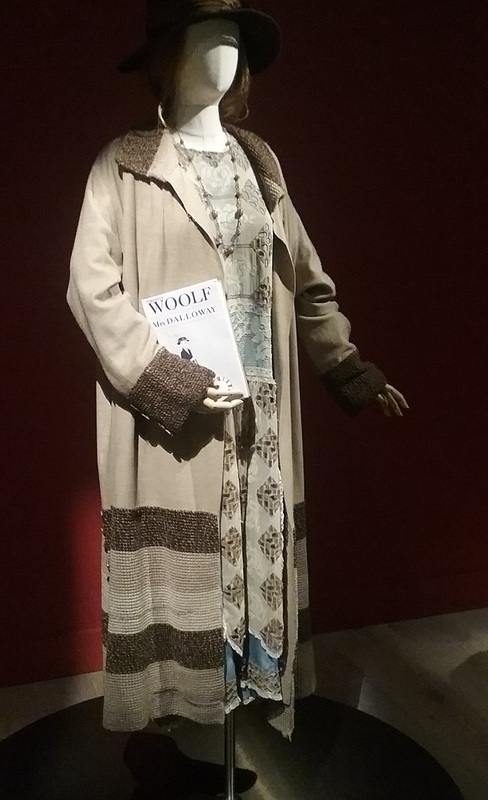 This costume was also worn by Mildred Natwick. What a way to end a long and varied career! 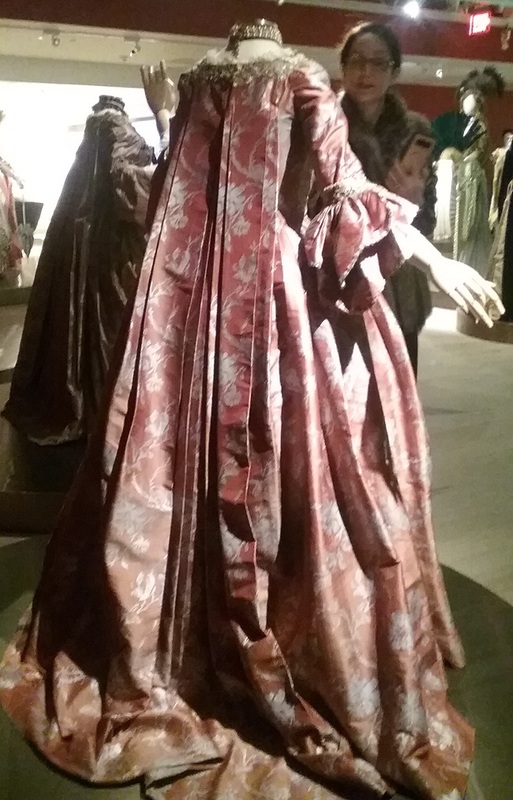 And finally, this gown worn by Swoosie Kurtz, who at forty-five was a youngster compared to Natwick. 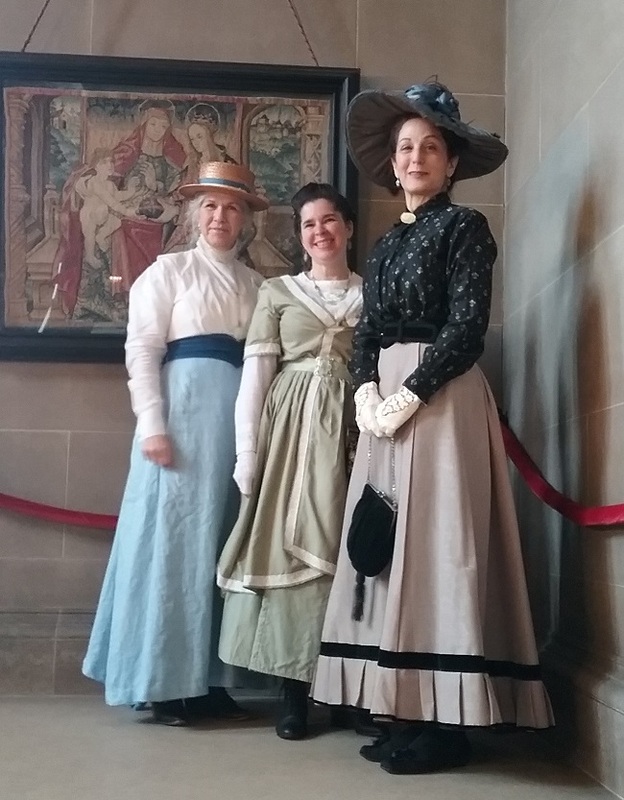 Still, it’s great seeing “older” women dressed fashionably, and not in dark colors as is so often the case. 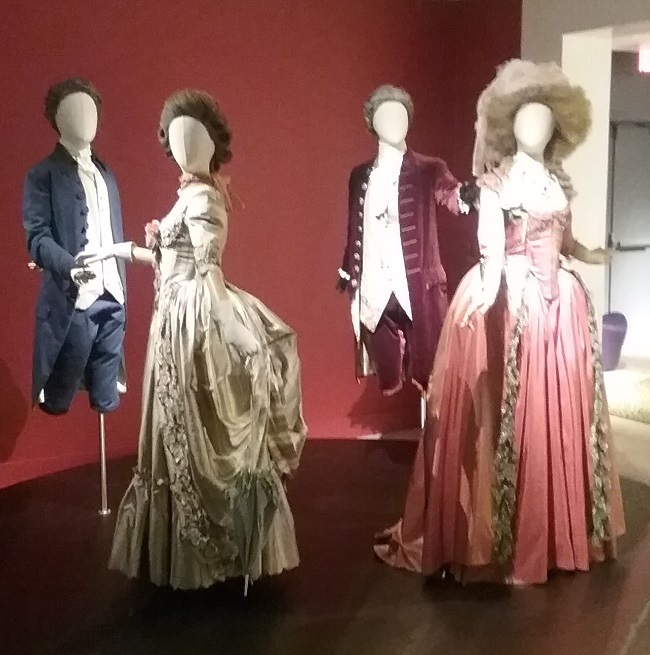 These four costumes are from The Duchess, which starred Keira Knightley, and which won a best costume design Oscar for designer Michael O’Connor. 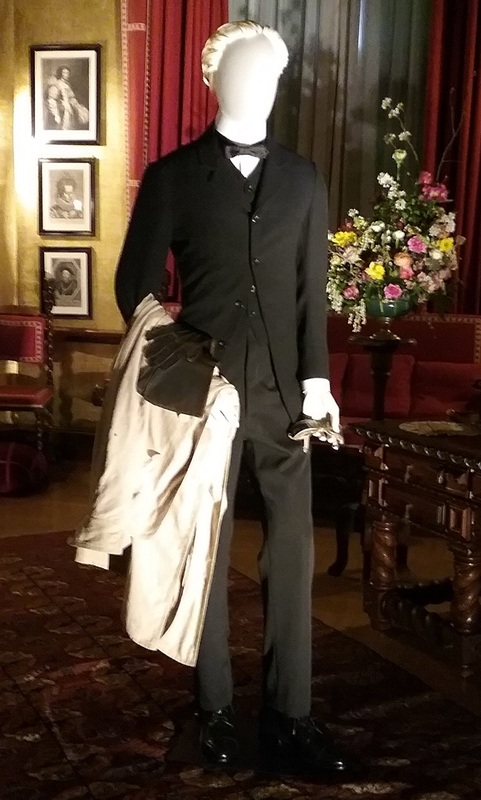 I need to say at this point that there were, in fact many men’s costumes on display as well, but a simple suit with knee pants tends to be over-shadowed by a lavish silk gown. 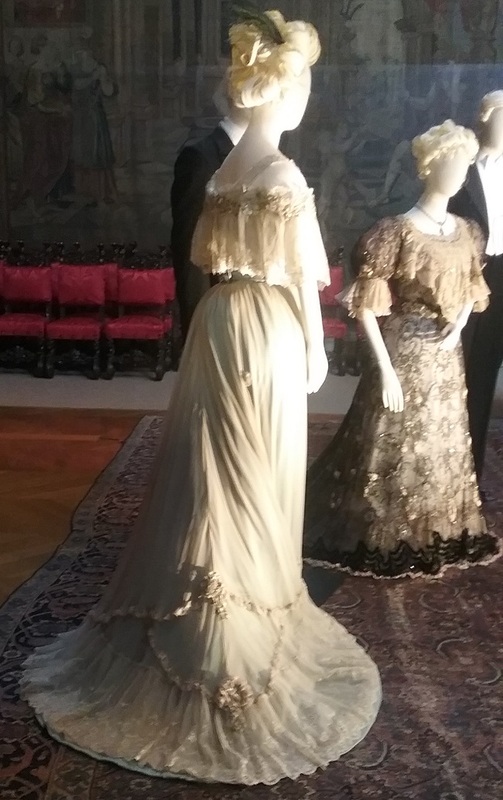 Both of the gowns is this set were worn by Knightley. 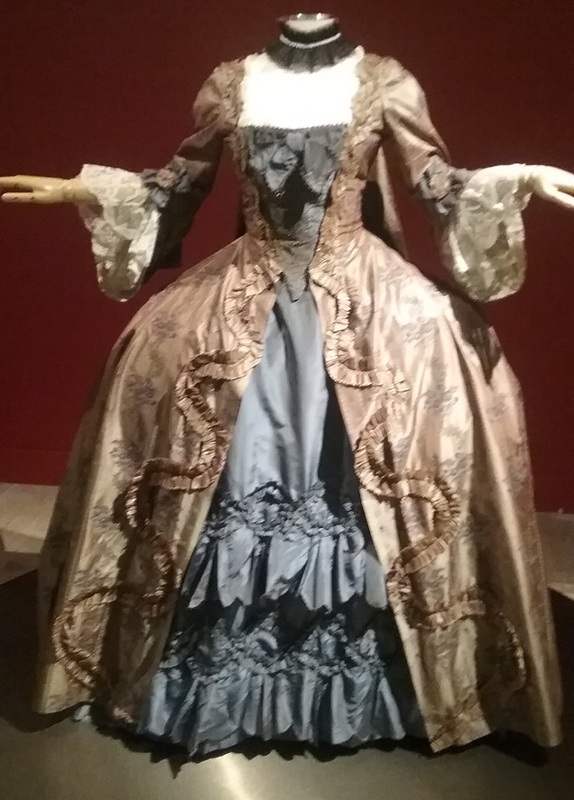 I have been reading a lot about eighteenth century fashion lately, but I have so much to learn. 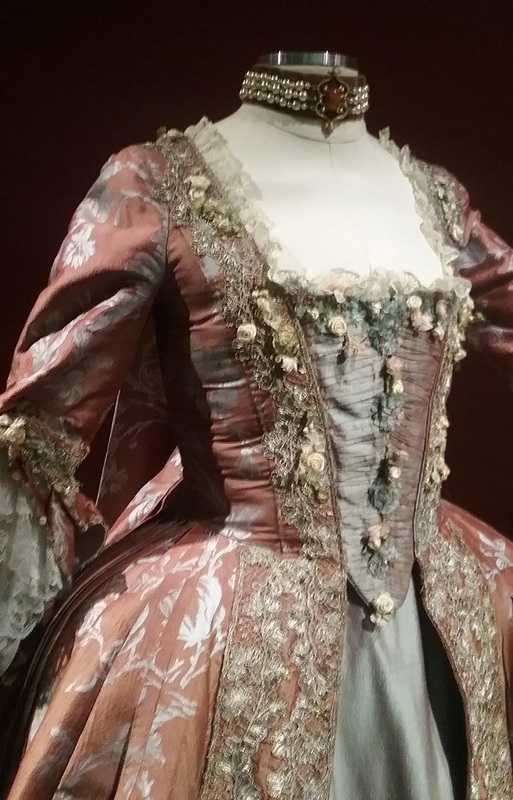 Still, costumes from this period always seem to be oddly over-ornamented. Feel free to correct me if I’m wildly off base. That is a hair style I’ll never understand. 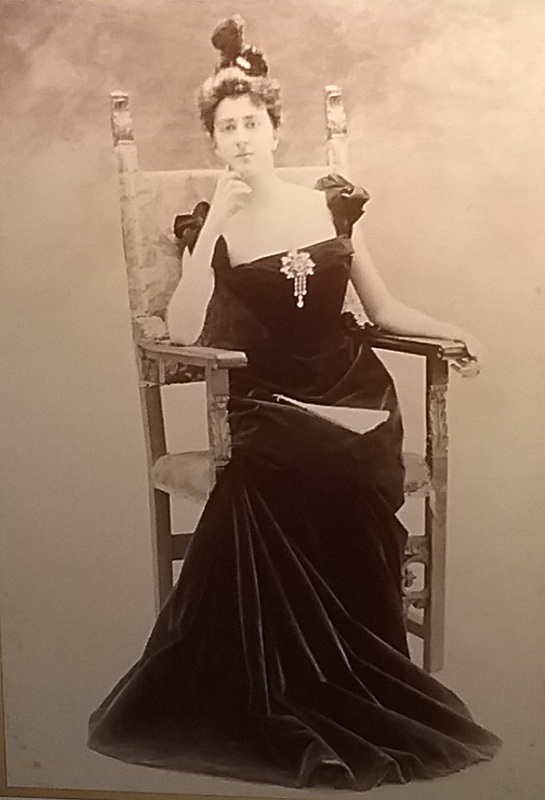 I do try, however not to make judgments about the clothing, hair, and make-up of people in the past. 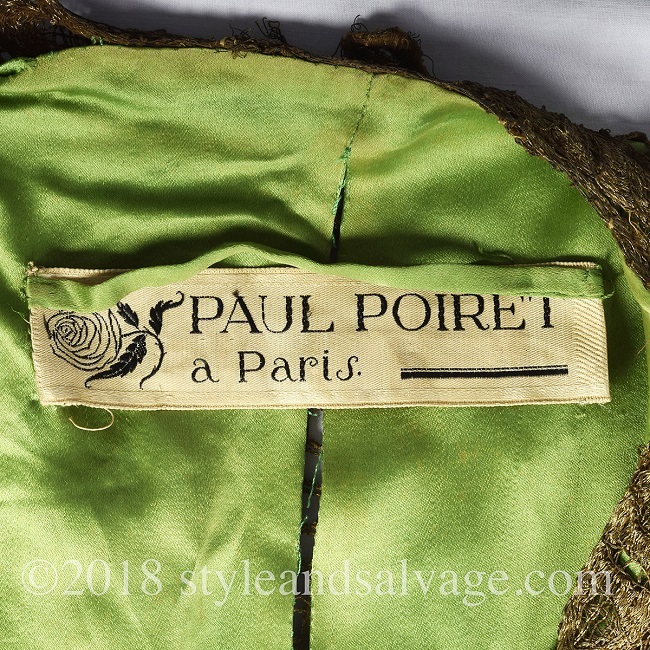 Since costumes have to be practical, they often don’t have historically correct closures. 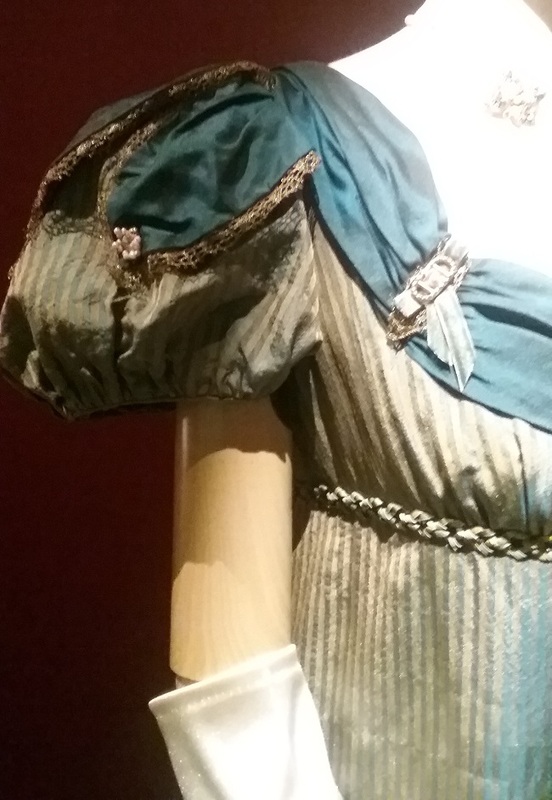 It’s not very often that one sees a zipper in a pre-1930s costume these days, but eighteenth century bodices seem to present access problems. 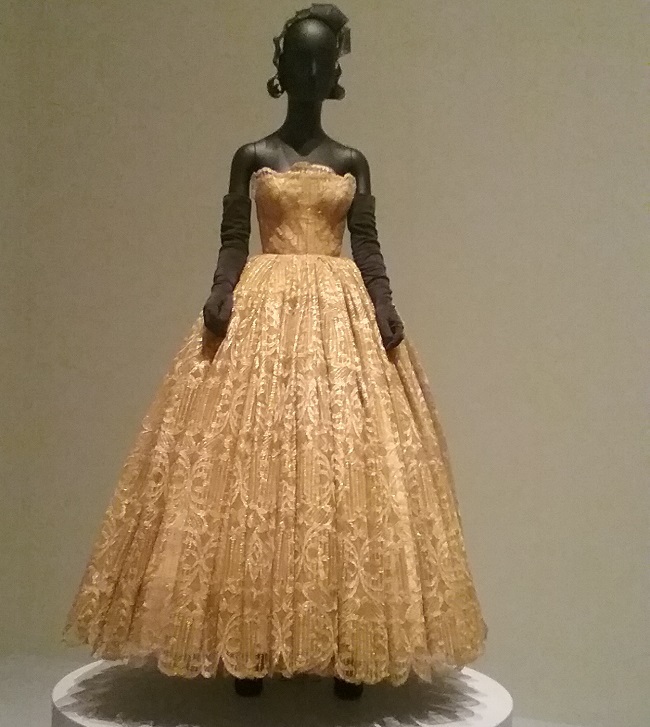 This dress was closed using hook and eyes. 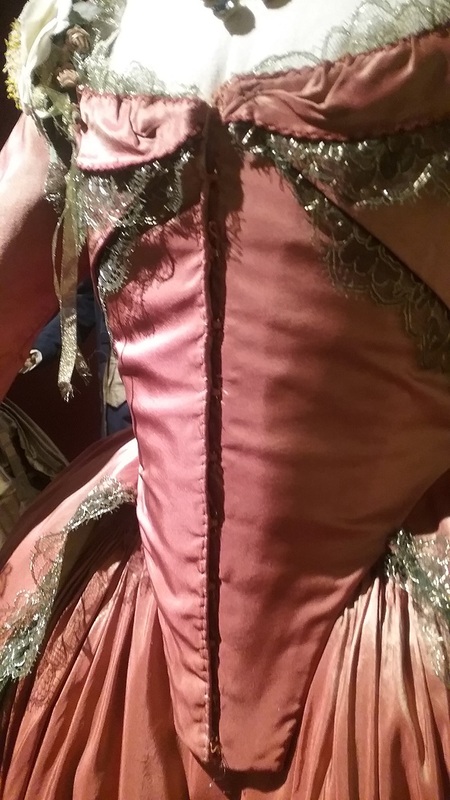 And the stomachers seen above in the Dangerous Liaisons costumes above were sewn (rather than pinned) shut. 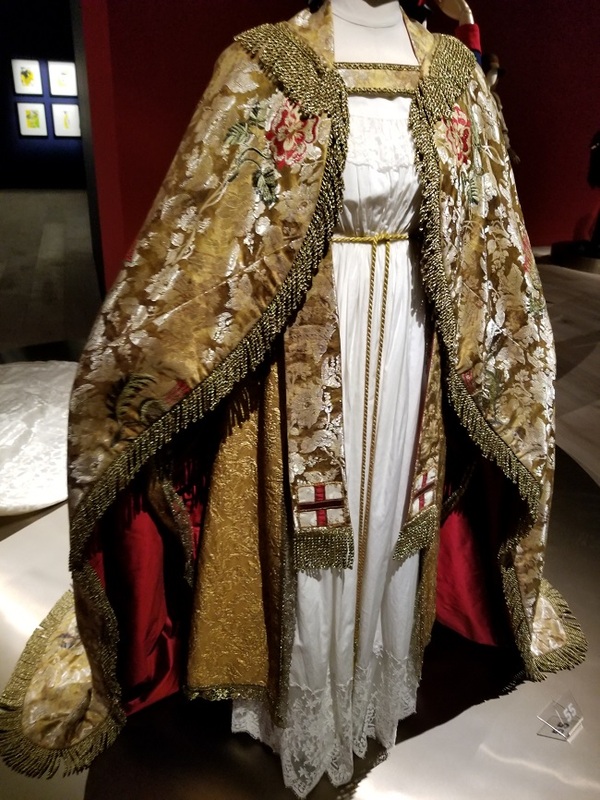 Was the actress literally sewn into her robe? 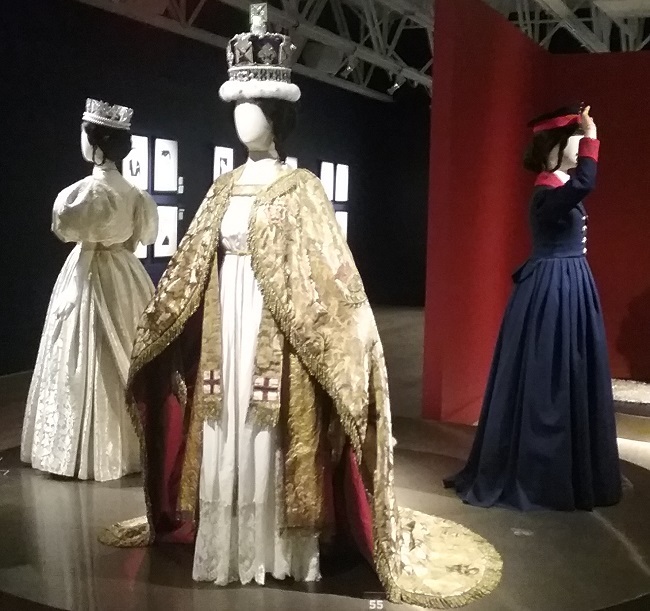 The three costumes above were worn by Jenna Coleman in the BBC television series, Victoria. 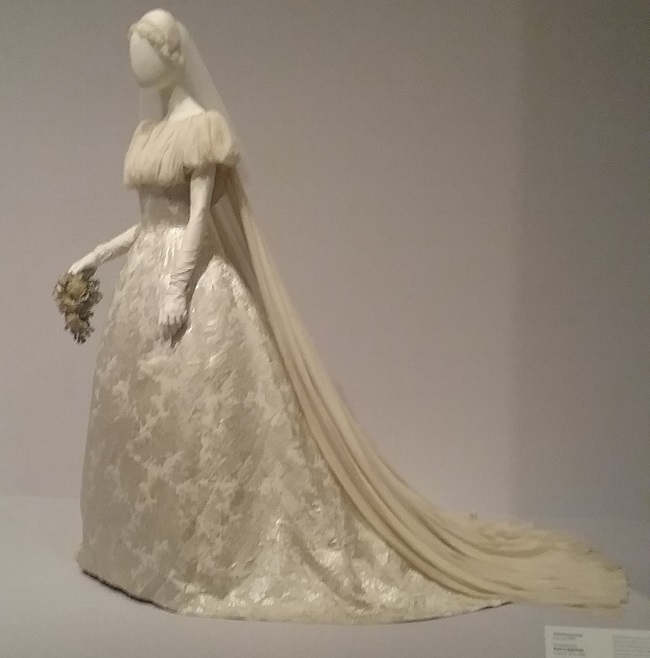 This program is about the young Victoria, and so begins in 1837 as she ascended to the throne. 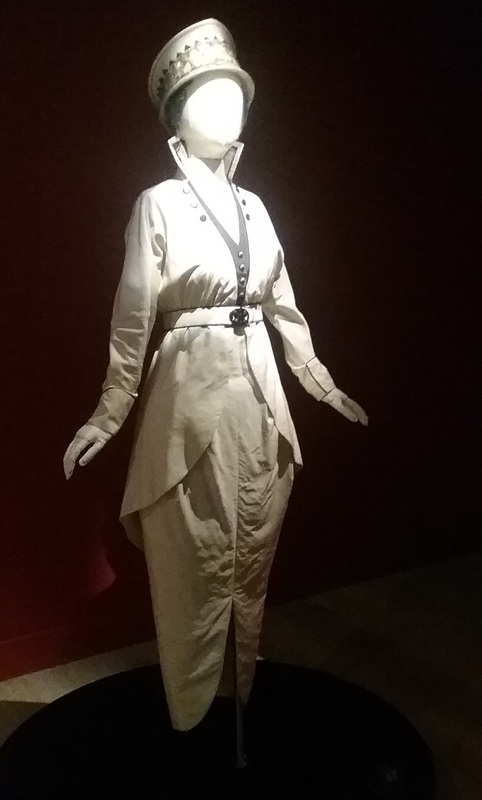 Here is my favorite of the entire exhibition, a nautical-inspired riding habit. You can’t tell from my photo, but the red band on her cap is lace. Very queenly. 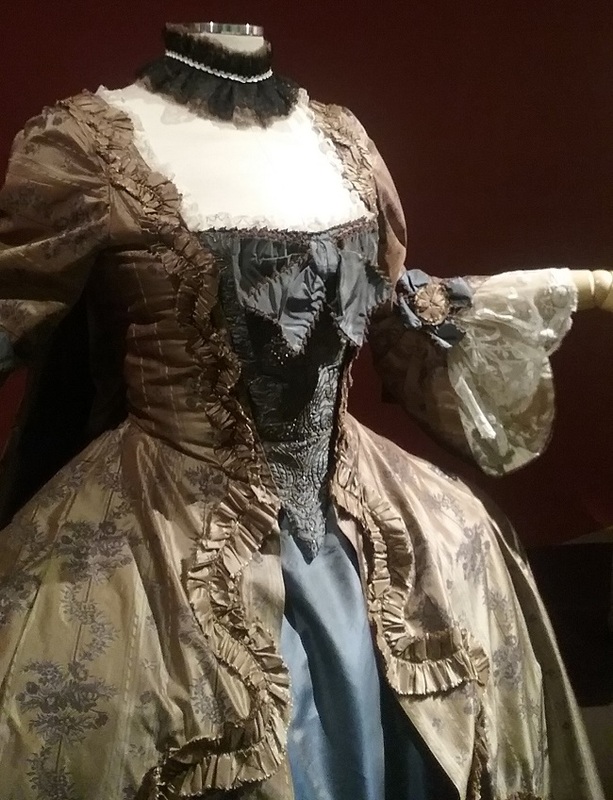 The other costumes from Victoria were not as successful. 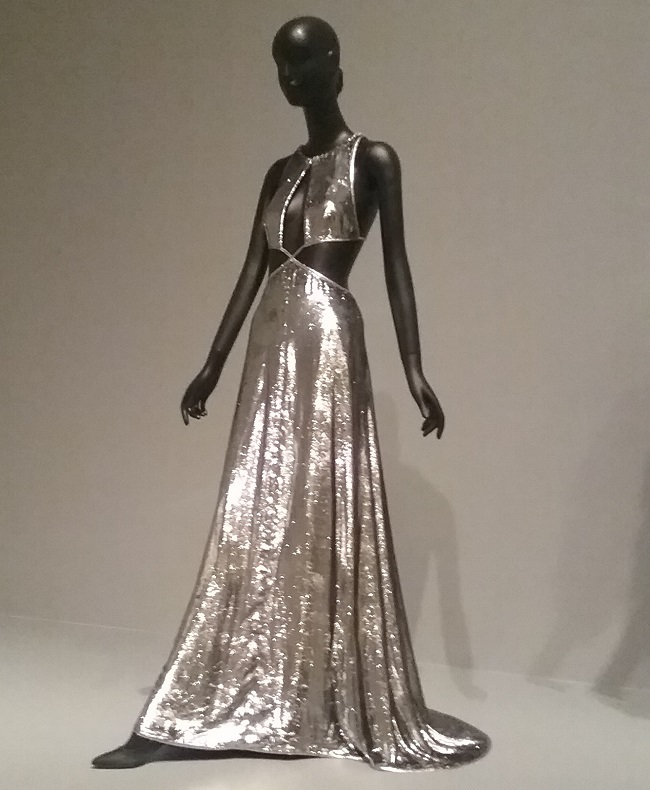 I thought this dress, used in a ballroom scene in the program, was too shiny. Okay, it looked cheap. 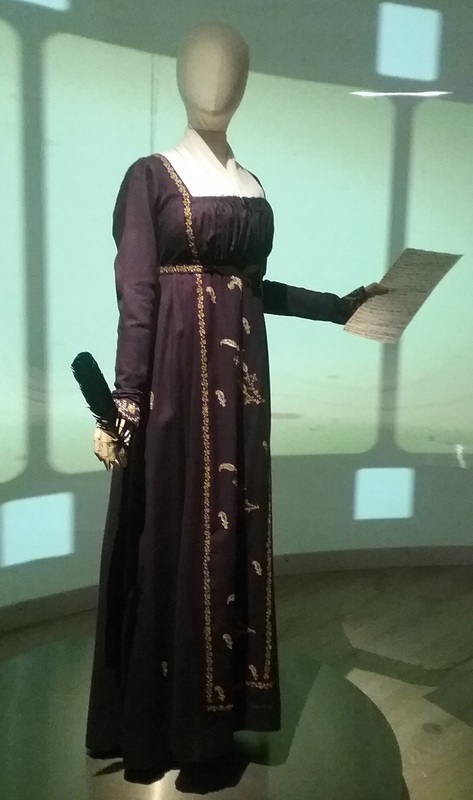 And I hate this photo because it does not convey just how interesting the robe is, and not in a good way. 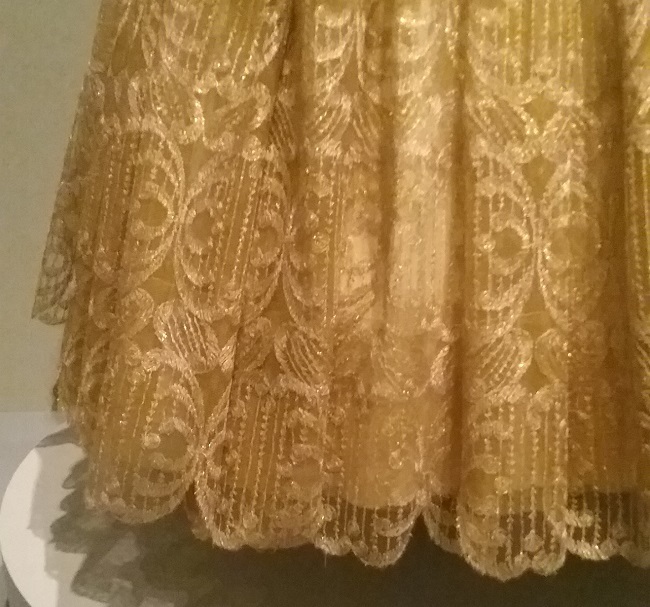 The exhibition guide tells me that the fabric was specially digitally printed, I’m assuming to replicate the original, but it just looks like someone’s old drapes, especially with the gold fringe. I’ve looked at stills from the show, and on film it looks much better, which is what matters. 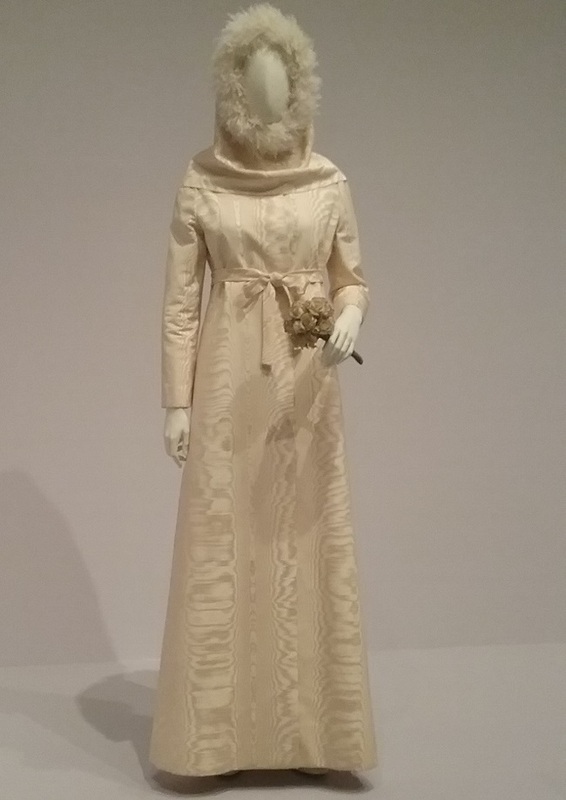 Update: And now, thanks to Liza, I have a much better photo of this robe, not that it improves the robe a whit. 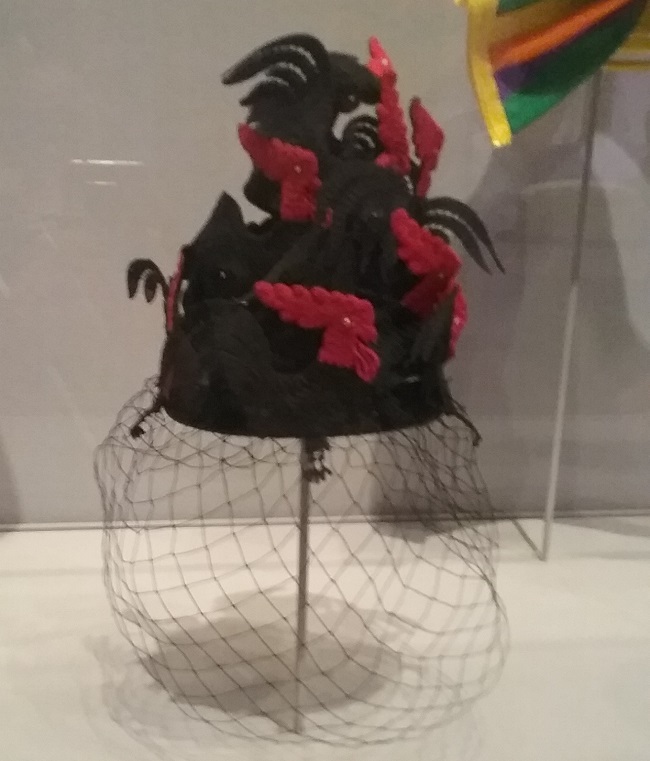 The crowns were not part of the loan from Cosprop, so SCAD student Tina Gancev designed and 3-D printed the one in the exhibition. They are amazing. 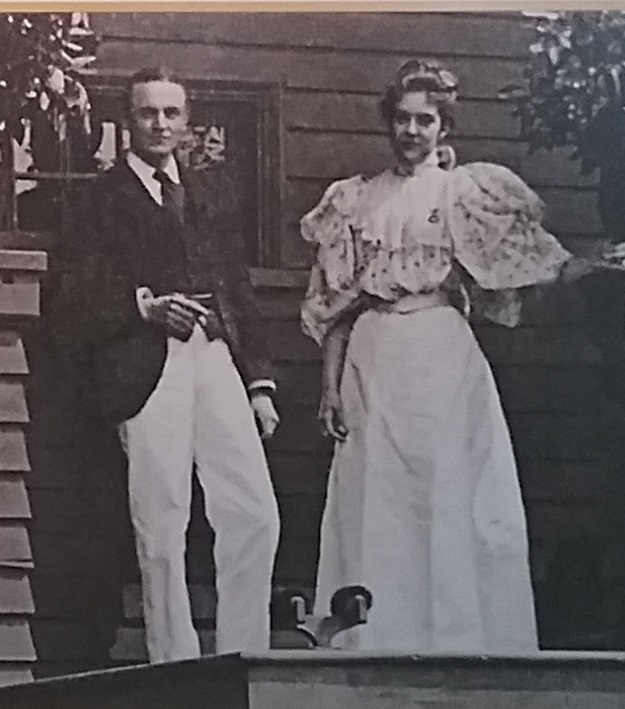 I’ll finish up next time with costumes from the twentieth century. 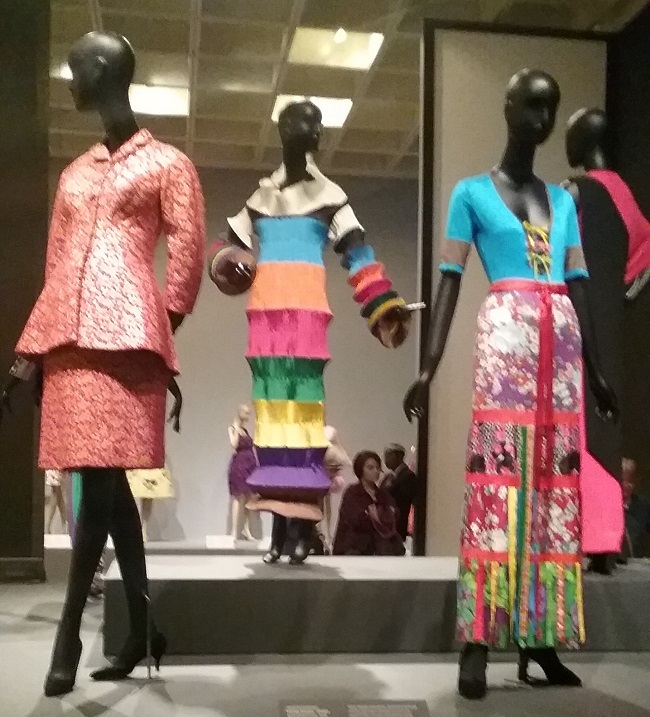 I had the great fun of driving to Atlanta to spend the afternoon with friend Liza at the latest exhibition at SCADFASH, Cinematic Couture. 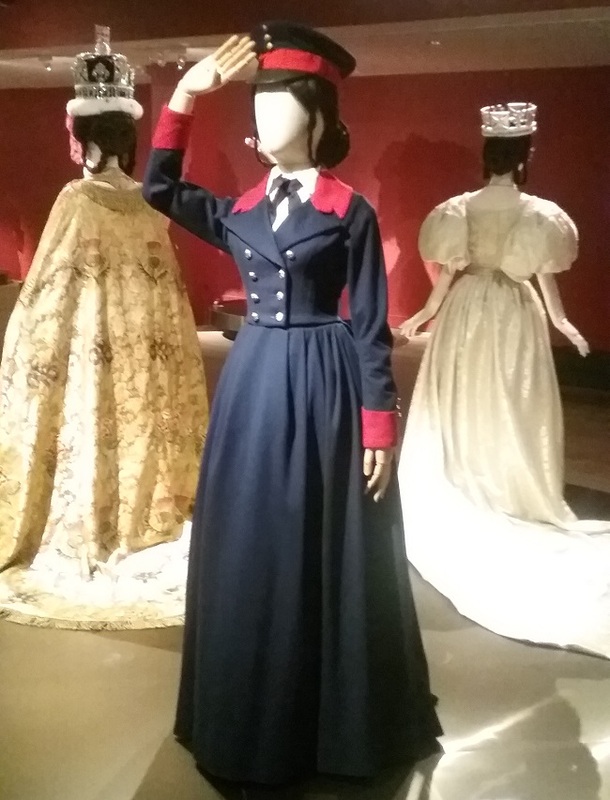 As the name tells us, this was a show of film costumes. 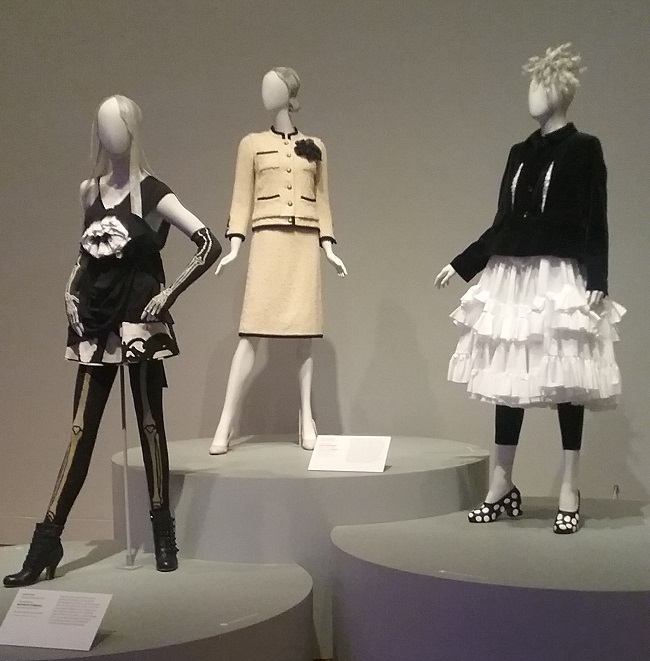 SCADFASH does not have a huge permanent collection from which to mount lavish exhibitions, so they rely on shows that travel. This one is from Cosprop, a UK based costume house. 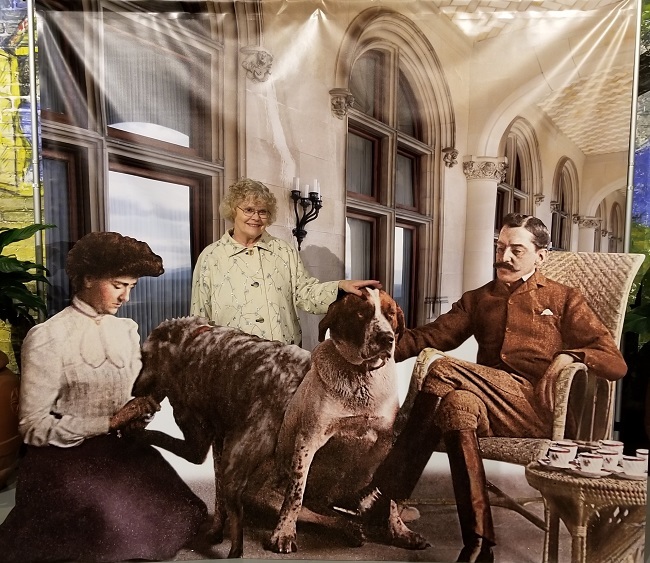 If the name sounds familiar, that’s because the exhibitions at Biltmore Estate I written about have also used Cosprop. 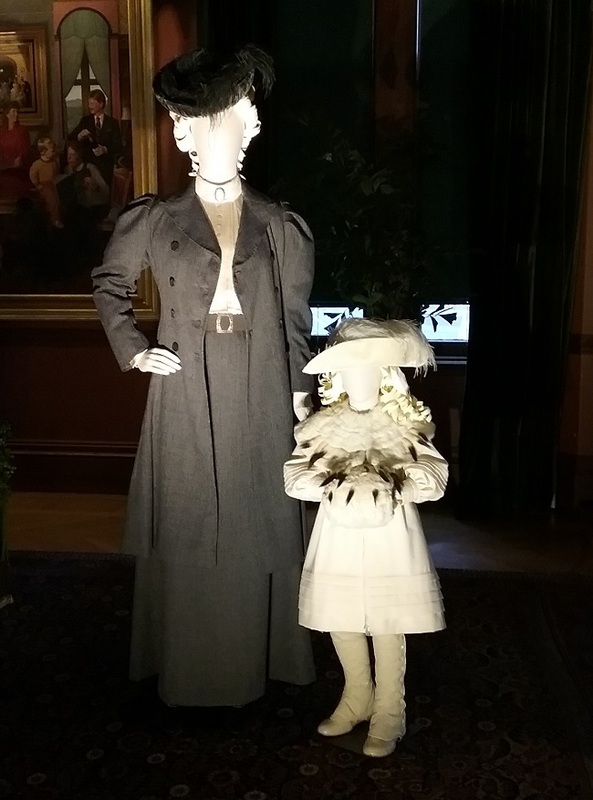 If you are a fan of British costume dramas, you have seen Cosprop’s work. 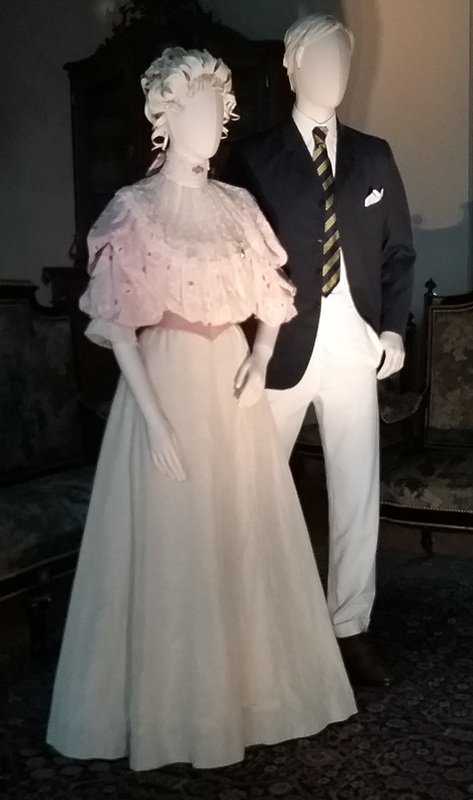 They have provided costumes for everything from Downton Abbey to the 1996 version of Pride and Prejudice. 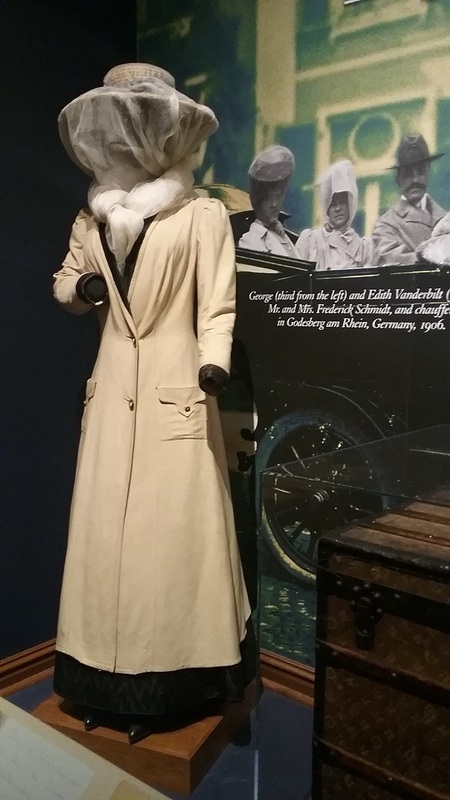 I was a bit concerned that this exhibition would be a repeat of costumes we had already seen, and there was indeed a bit of overlap. 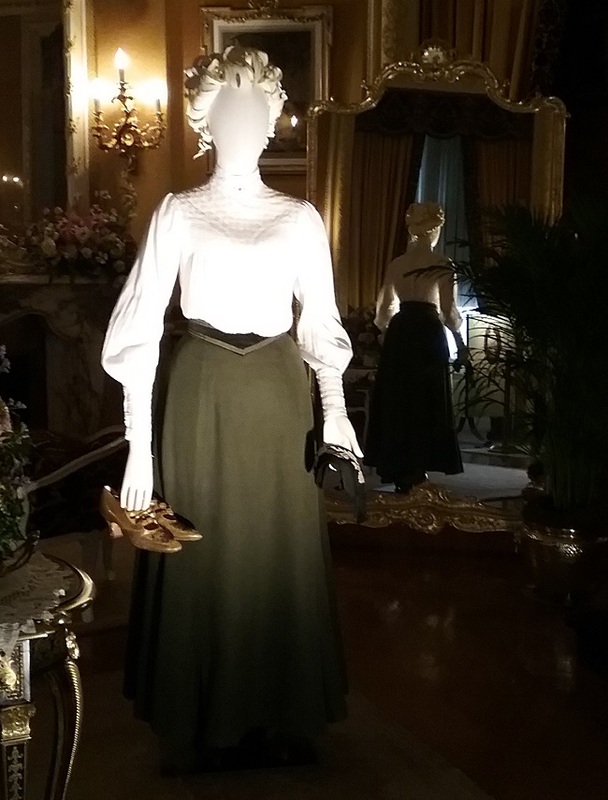 However, it was the experience of seeing the same garments at two different venues that ended up being one of the biggest revelations of this visit. 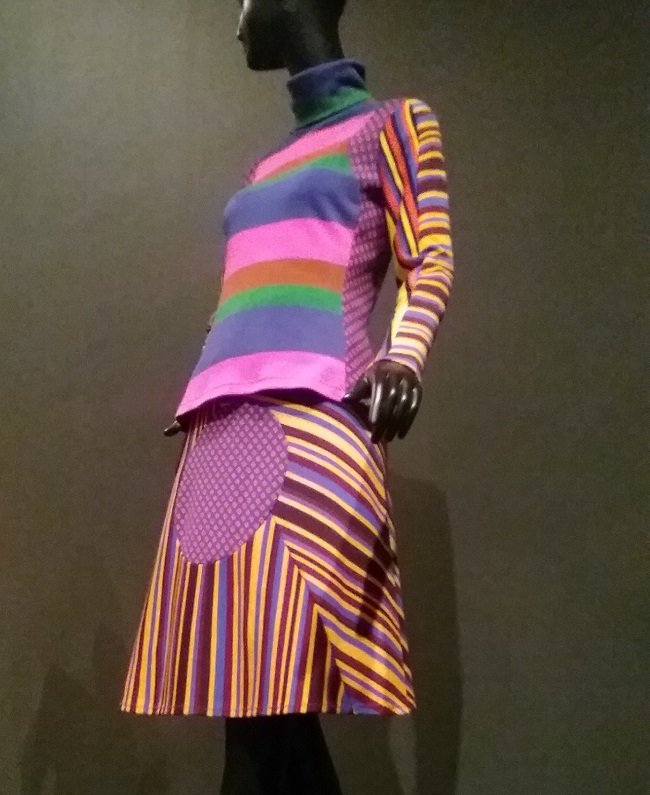 There’s so much that I love about SCADFASH exhibitions, so I’ll start there. The big first thing is the ability to get close to the garments. 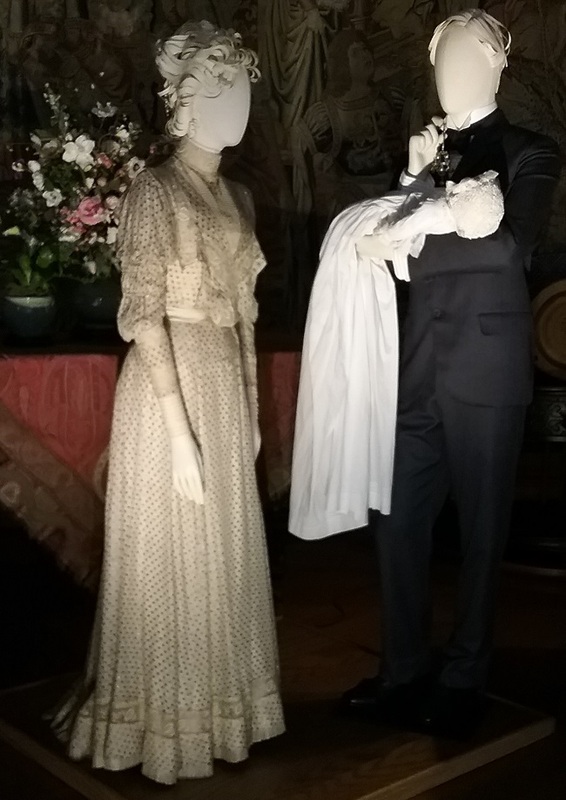 At Biltmore some of the garments are behind glass due to their being displayed in unmonitored locations. 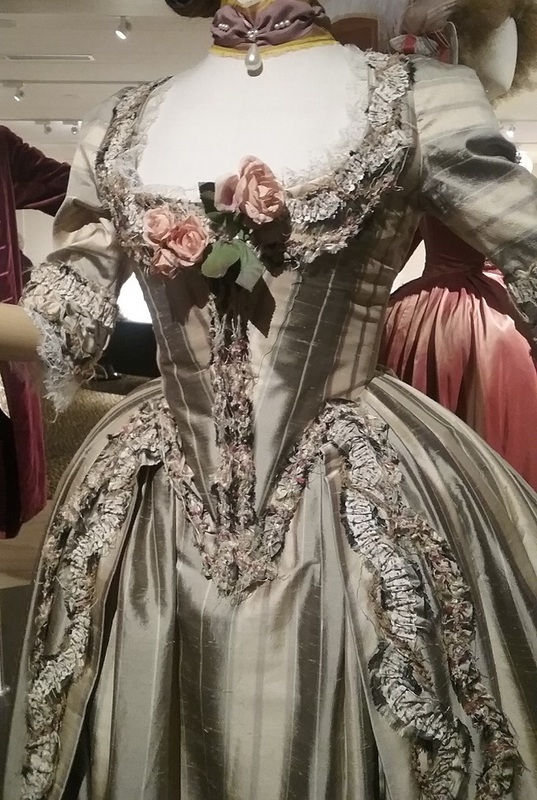 The dress, above left, is an embroidered wool dress worn by Anne Hathaway in Becoming Jane, a film about how Jane Austen became the writer we know, and most of us love. 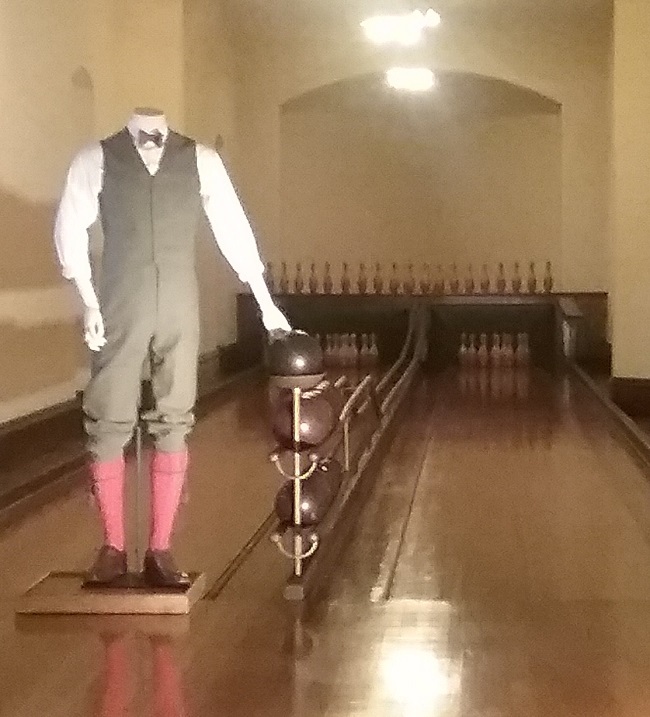 We didn’t give it much of a second look when we saw it at Biltmore. 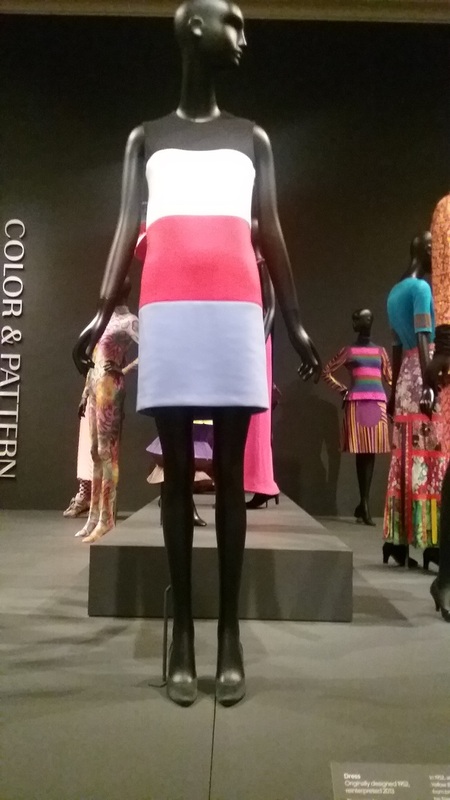 But here we can see the same dress as presented at SCADFASH. The mounting was so much better, but it was being able to actually see and appreciate the details that made the difference. 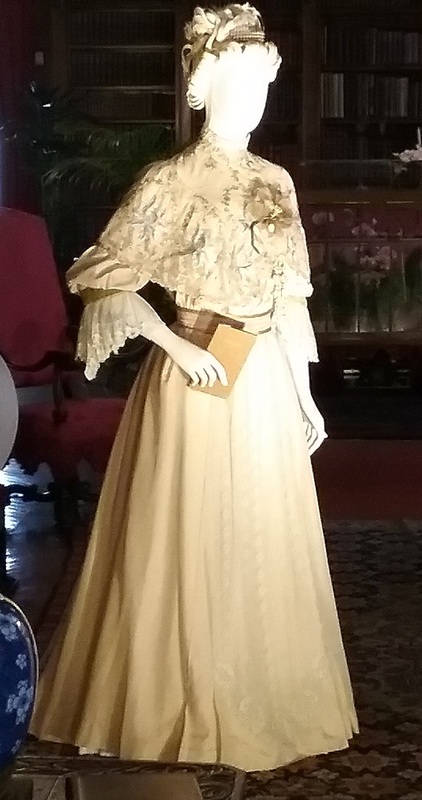 The dress at Biltmore was in a hotel public space, and the windows caused so much glare that the dress sort of disappeared into the glass cage. I’m always amazed at all the work that goes into just one costume. 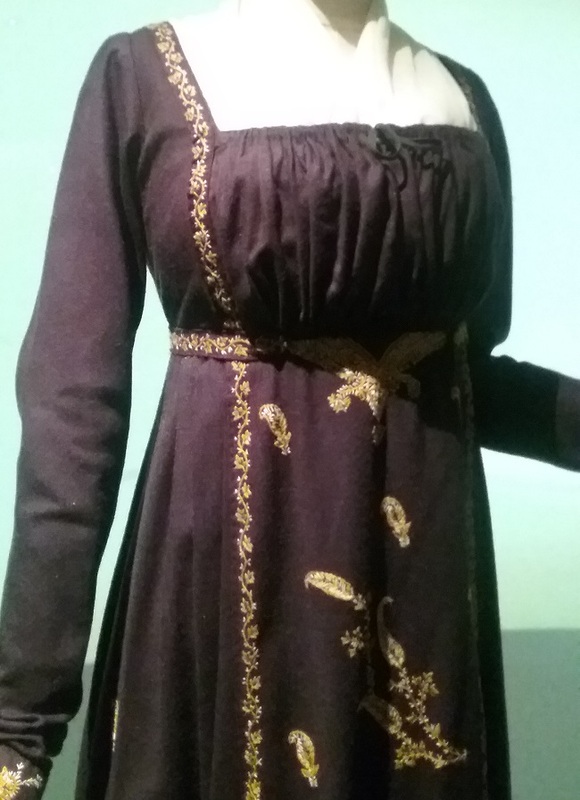 This dress was hand embroidered, though some of the others had smaller areas of machine embroidery. 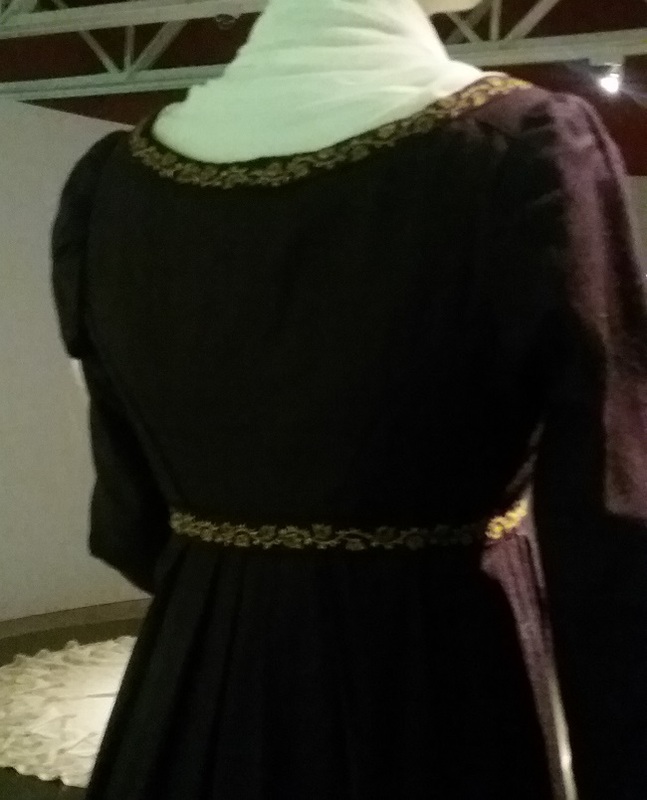 Well, I’m sorry that the back view is poor, but the point is that you can see the back. 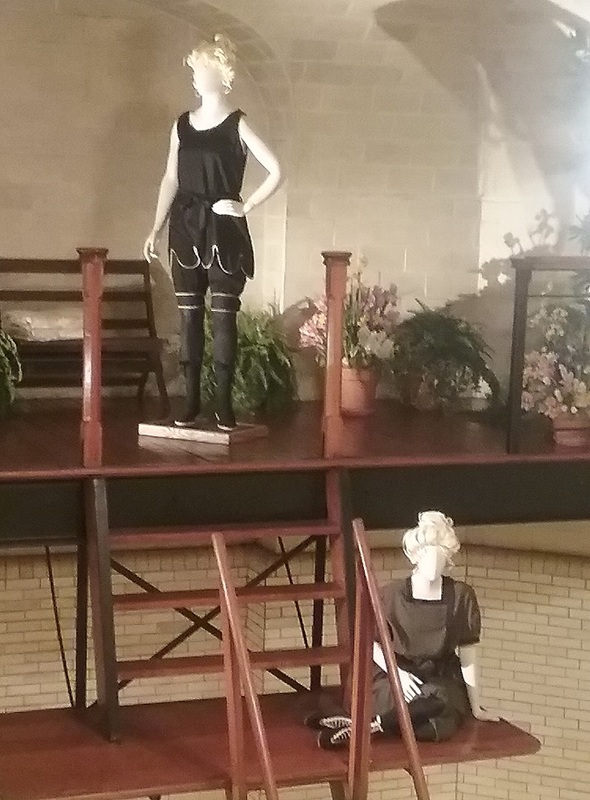 Most of the costumes are displayed on circular platforms that are pulled away from the wall enough so that visitors can go behind most of the garments. The docent who was assisting us said that was a deliberate choice because so many visitors were trying to squeeze behind the exhibits to see the backs. 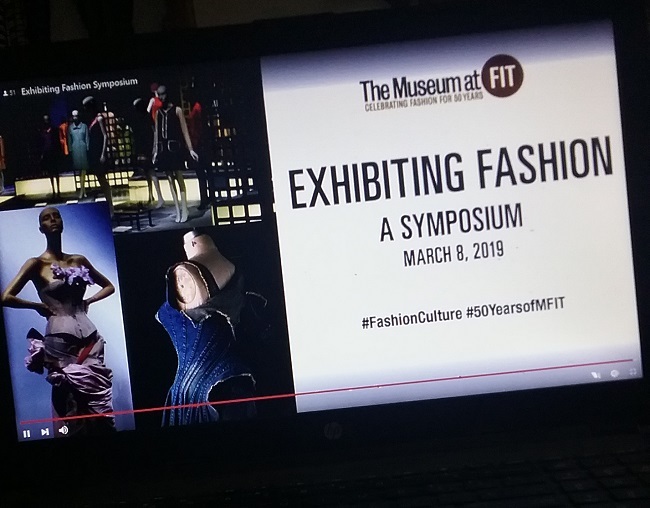 So thanks SCAD for making it easy for us. 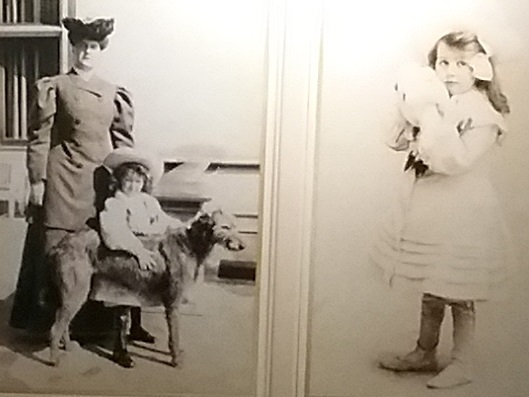 Just so you’ll not think I’m picking on Biltmore, here’s another comparison shot. 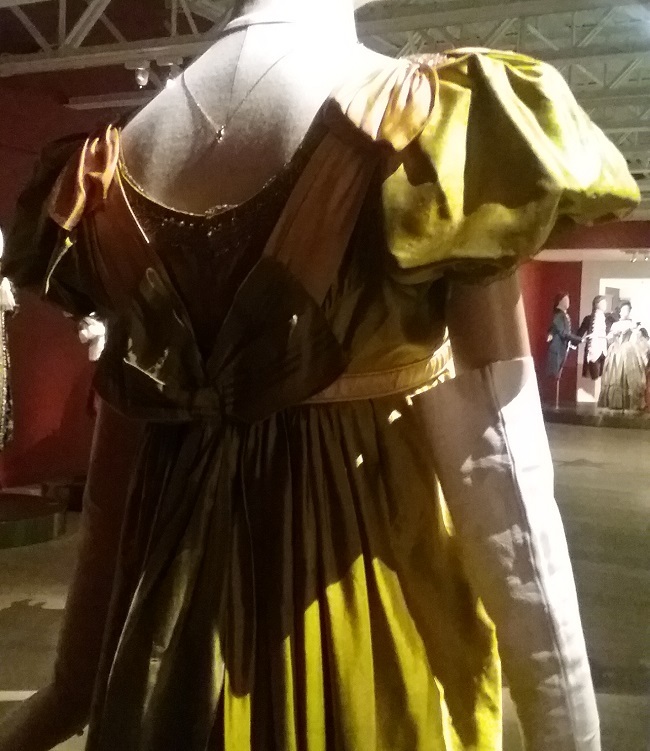 This dress was worn by Emma Thompson is Sense and Sensibility. 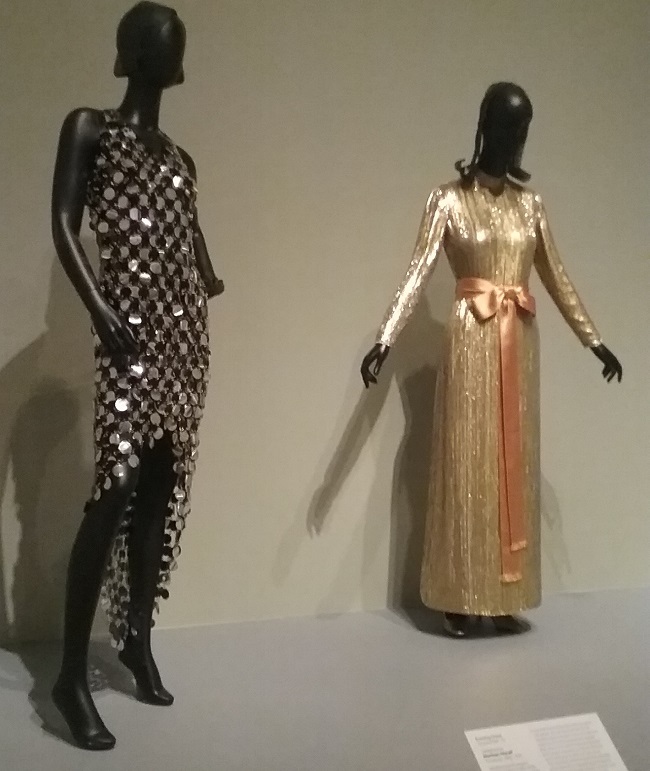 On the left is the dress at SCADFASH, and on the right you see it at Biltmore. While the glare on glass is still distracting, I like the mount better, especially the way the shawl is draped. And the fit just looks better as well. 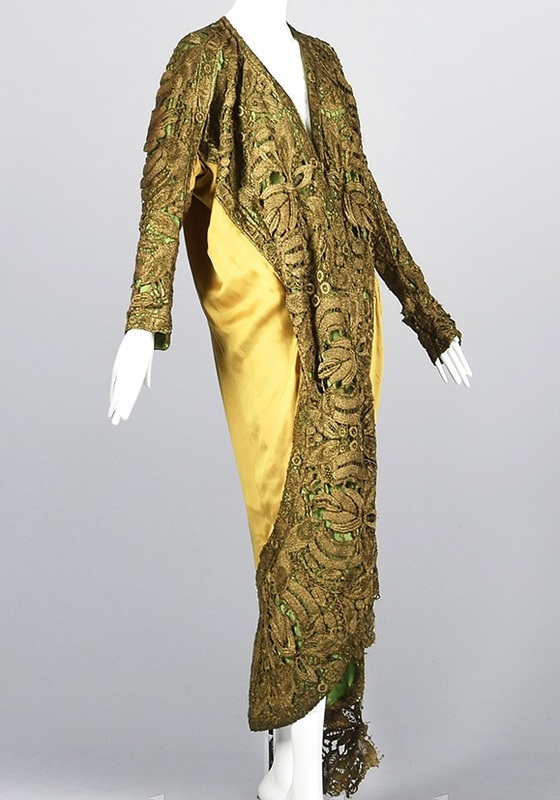 Again we are treated to the back of this costume, with that lovely little train. 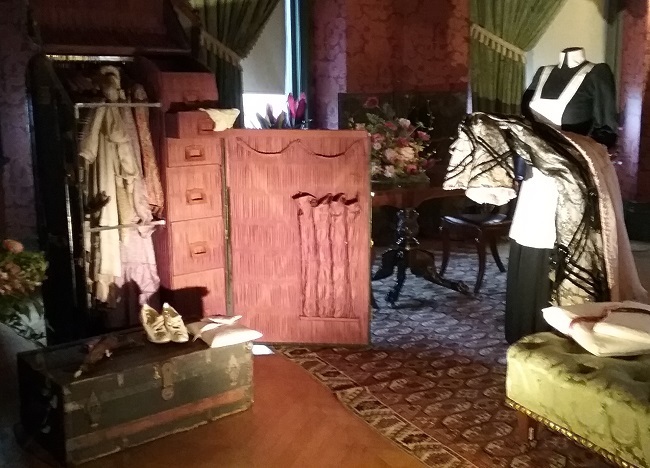 You could see the back at Biltmore as well, but it seemed a bit cramped in that glass box. 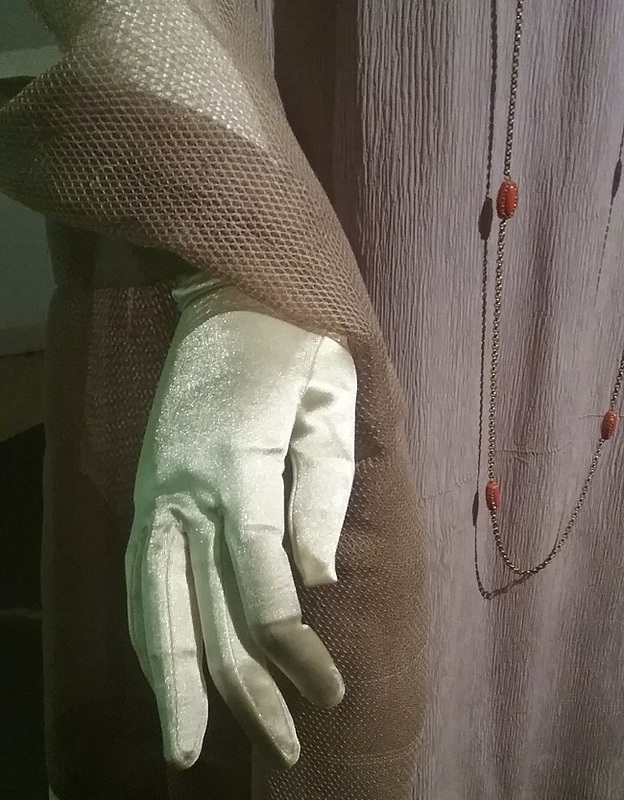 Here you can see the lovely texture of the dress and of the shawl, but you can also see one big old blaring anachronism: shiny modern synthetic gloves. 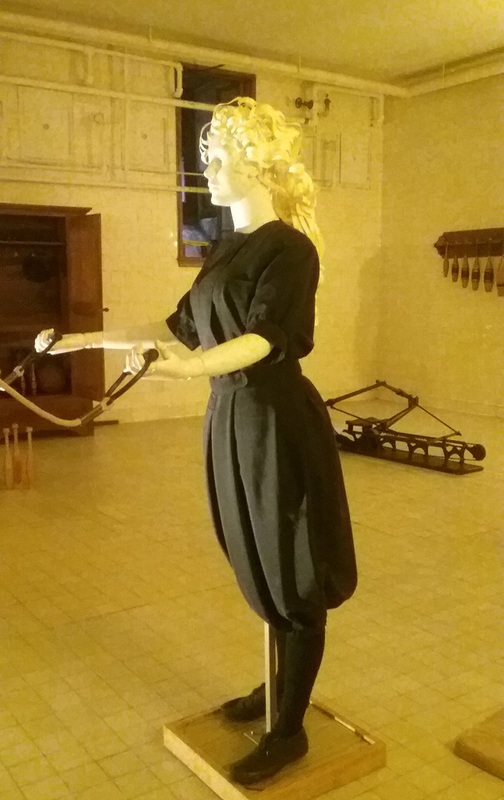 We had a bit of a discussion with the docent, and then the curator appeared and we had a word or two with him as well. 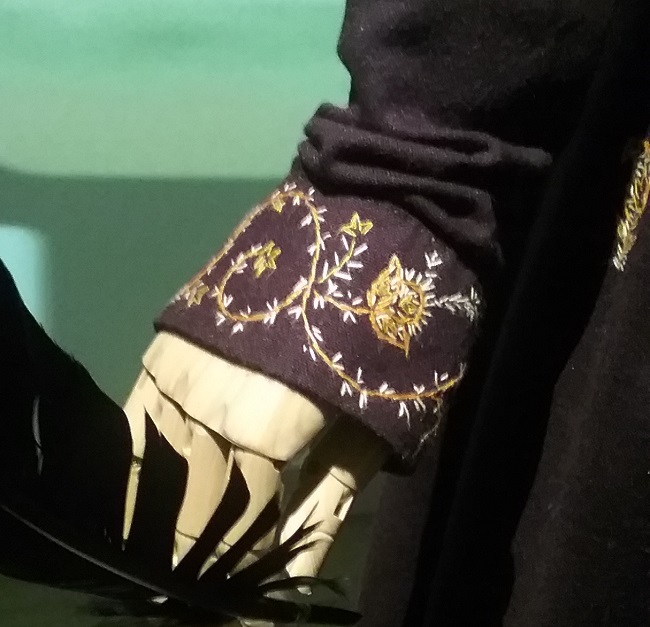 As it turns out, Cosprop sent the gloves used in the films, but in many cases they were too small to fit on the mannequins’ hands. We tried to point out that the exhibits would look better with no gloves at all than with these silly shiny things. 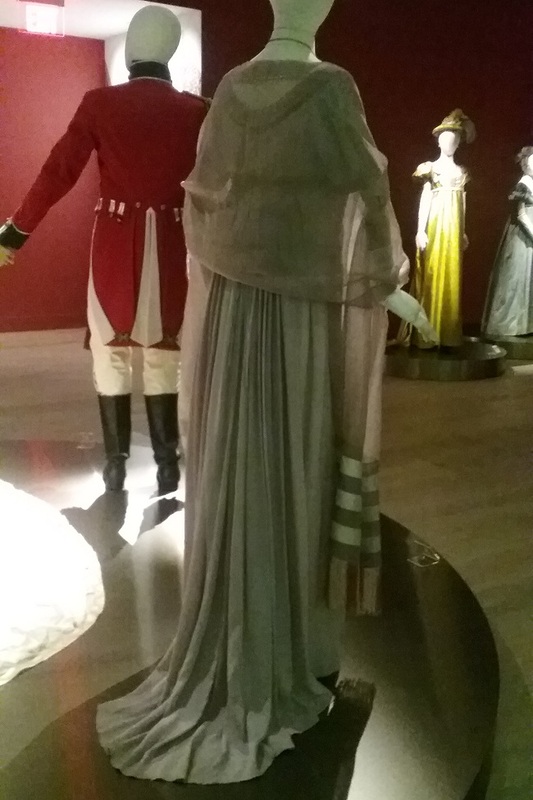 It seems like Jane Austen is always a favorite, and my guess is that costumes were chosen at least in part because they were likely to have been seen by most visitors. 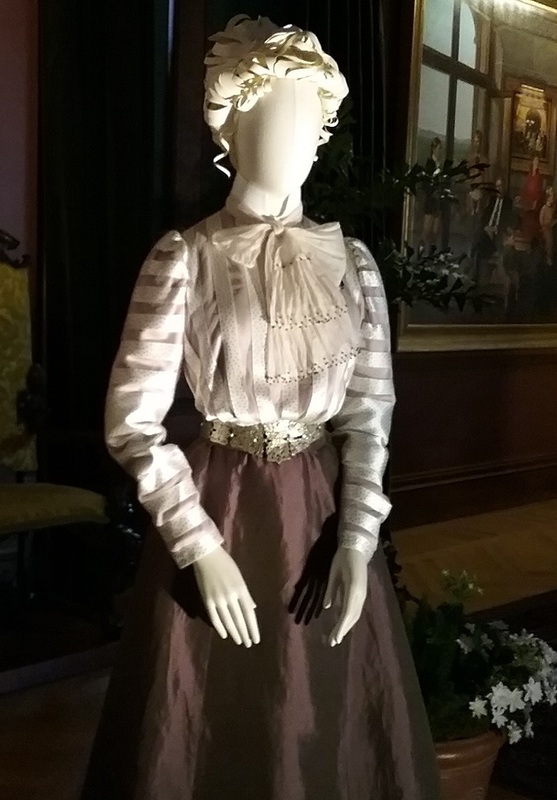 This costume was worn by Miss Bingley in Pride and Prejudice. 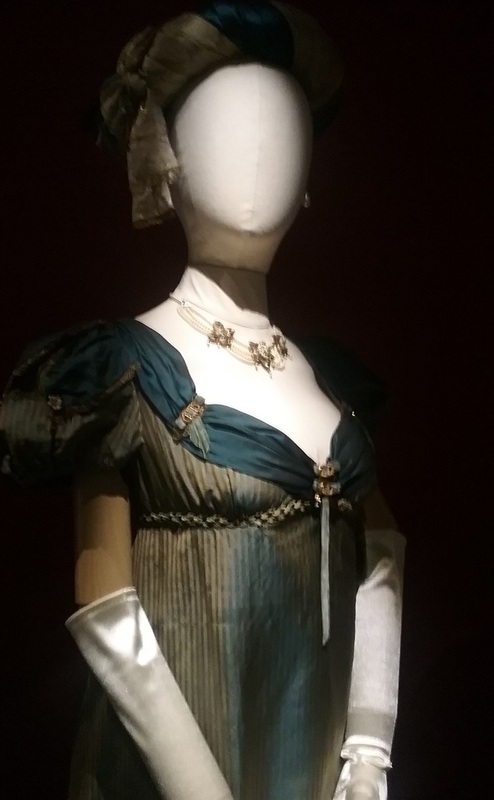 And this was worn by the other Bingley sister, Mrs. Hurst. 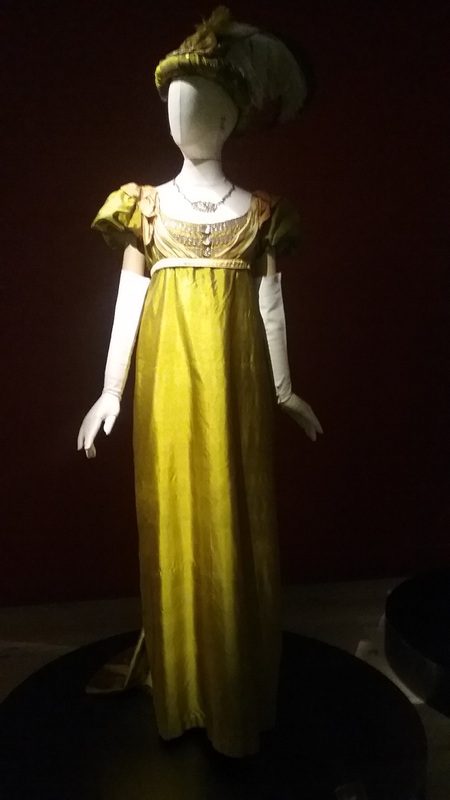 I don’t have a photo of the dress representing the heroine of Pride and Prejudice, Lizzie Bennet, but her dress was quite plain in comparison to the richer city girl Bingleys. This is a button from Mr. Darcy’s waistcoat. 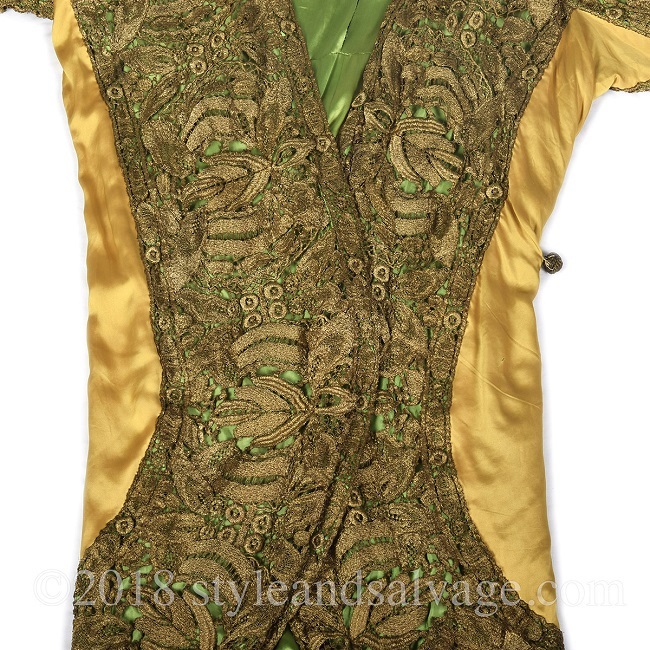 The button is hand embroidered, but the buttonhole looks machine made to me. Still, it shows an amazing concern toward the details. 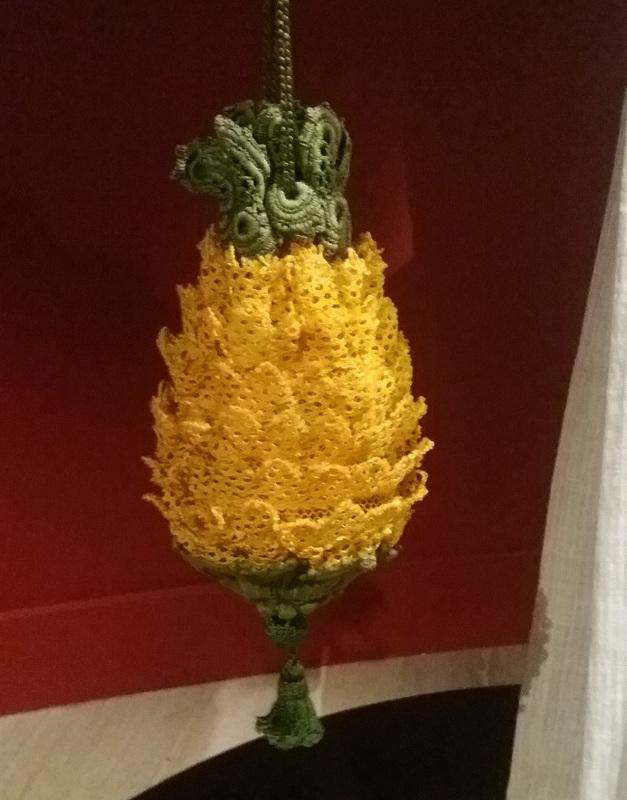 My last Regency/Austen photo is this crocheted silk pineapple purse. It was carried by Elizabeth Elliot in Persuasion. 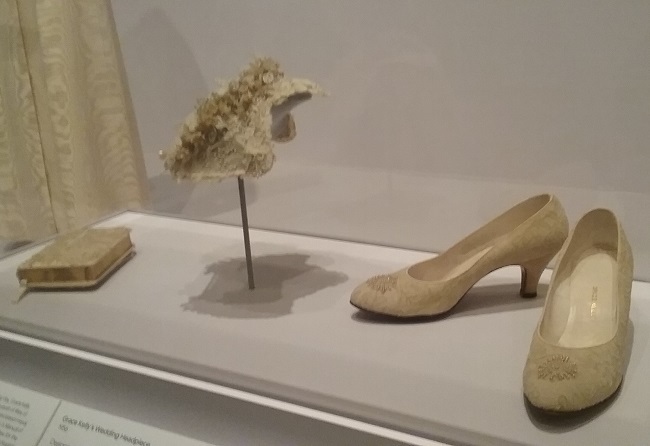 It just goes to show how one special little piece can really make one’s costume. In my next installment we’ll go back in time to the Georgians, and forward to the Victorians.